The price of photovoltaic (PV) systems in the United States (i.e., the cost to the system owner) has dropped precipitously in recent years, led by substantial reductions in global PV module prices. However, system cost reductions are not necessarily realized or realized in a timely manner by many customers. 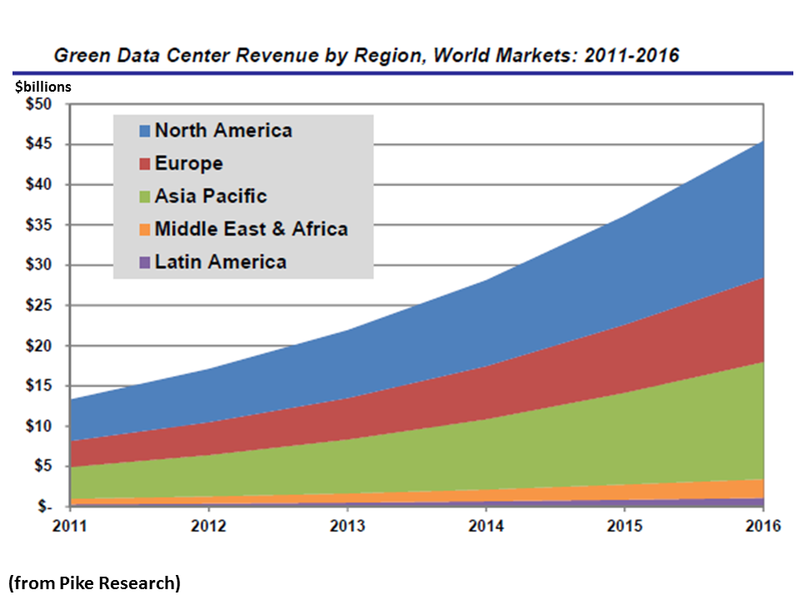 Many reasons exist for the apparent disconnects between installation costs, component prices, and system prices; most notable is the impact of Fair Market Value considerations on system prices. To guide policy and research and development strategy decisions, it is necessary to develop a granular perspective on the factors that underlie PV system prices and to eliminate subjective pricing parameters. This report’s analysis of the overnight capital costs (cash purchase) paid for PV systems attempts to establish an objective methodology that most closely approximates the book value of PV system assets. • $4.40/WP DC – 187.5 MWP DC one-axis utility-scale ground mount. Significant variation (standard deviations of 5%–8%) exists in these estimates due to regional and site-specific cost factors. Most notable is the impact that the wide range of U.S. labor rates and installer productivity (experience) factors can have on installation costs. This uncertainty analysis excluded the impact of system size, which can also play a significant role in determining installed system prices. • $1.91/ WP DC – 187.5 MWP DC one-axis utility-scale ground mount (modified-SunShot target: $1.20/WP DC). 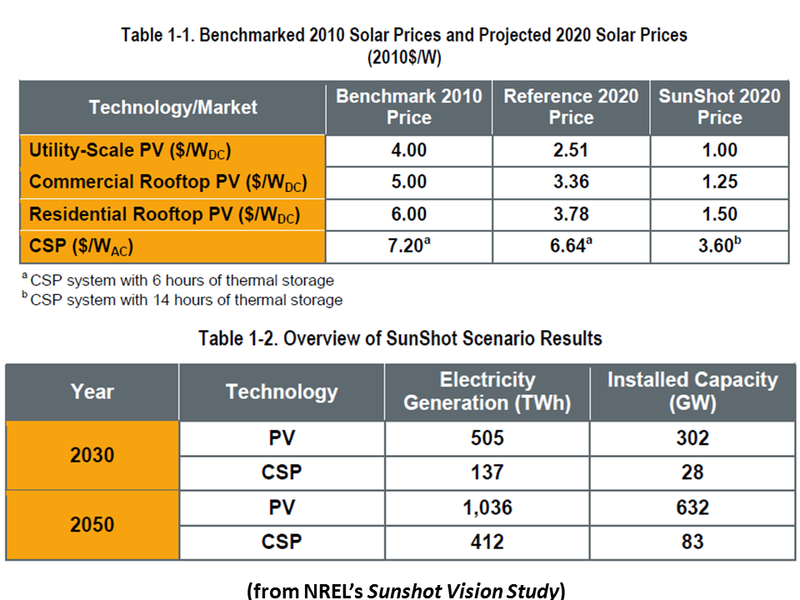 As these results show, the evolutionary estimates of U.S. PV system prices fall short of the 2020 SunShot targets. This highlights the challenges that remain before solar energy can compete with incumbent electricity technologies without subsidy. Unlike traditional energy-production technologies that have ongoing consumables costs, nearly all of the costs for photovoltaic (PV) systems must be paid at the beginning. Reducing those initial capital costs is crucial to reducing the cost of solar electricity. 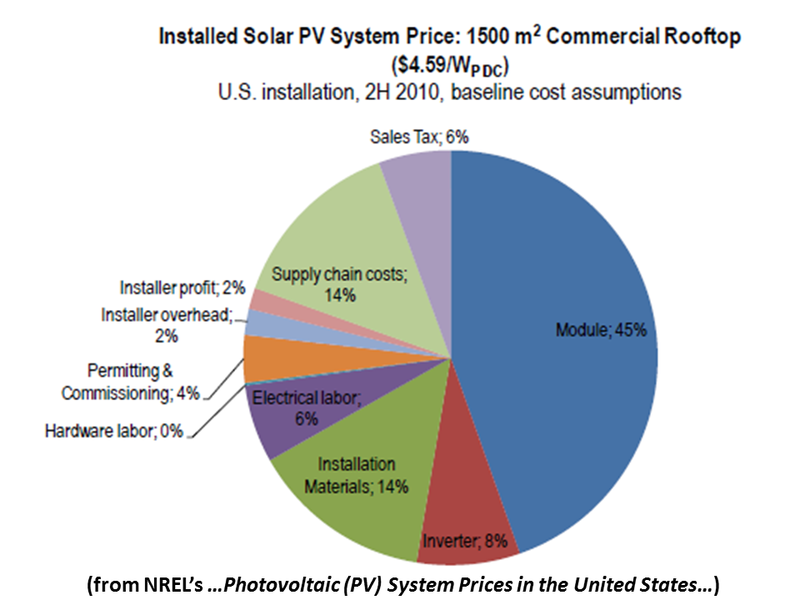 In addition to module price, many factors contribute to the price of a PV system, including installation labor, power electronics, permitting and other regulatory costs, and—in the case of ground-mount systems—site acquisition and preparation costs. Under its SunShot Initiative, the U.S. Department of Energy (DOE) has established very aggressive system price targets for each of the three major PV market sectors: residential rooftop, commercial rooftop, and utility-scale ground mount. Achieving these targets will require total system cost reductions of approximately 75% by 2020. 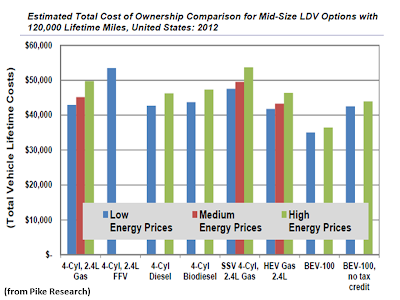 Industry stakeholders must understand the ever-changing PV system cost structure. 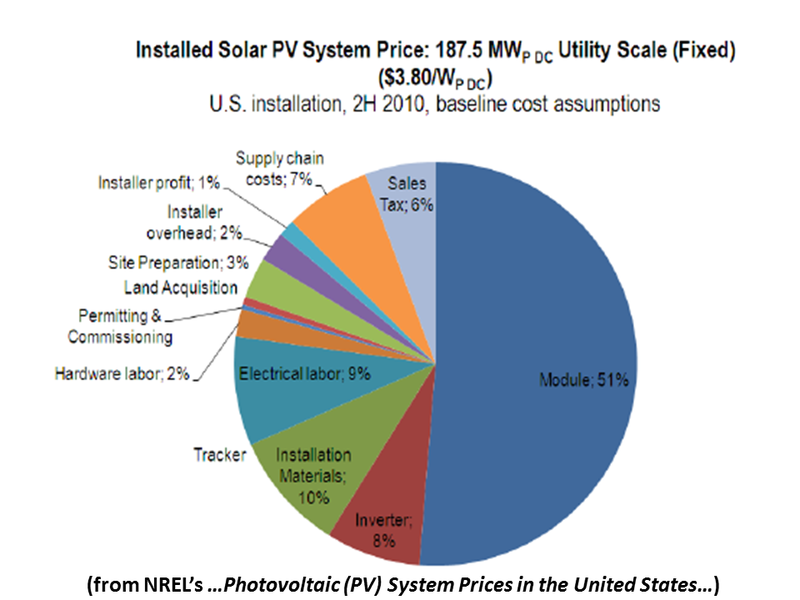 As module prices continue to fall, the contribution of non-module costs to the cost of solar energy will increase. There are also critical relationships between system components, such as the relationship between module conversion efficiency and non-module area-related costs and the relationship between module configuration and installation methods. Research and development (R&D) managers, policymakers, system installers, and component manufacturers must understand the current cost of PV systems in adequate detail to allocate effectively the resources needed for further cost reductions and to design effective market policies. 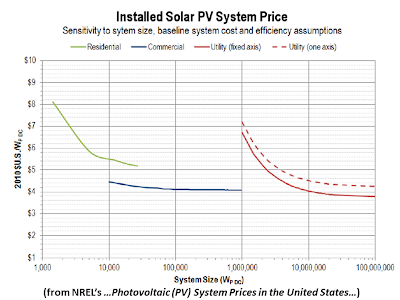 The resolution into PV system price drivers that is required for these decisions is difficult to attain from surveys of system prices, or by retrospective means. Results deviate based on regional, installer, and job-specific details, making accurate price comparisons between systems very difficult, unless conducted from the bottom up. This report presents detailed, bottom-up 2010 benchmark system prices for residential and commercial rooftop systems and utility-scale ground-mount systems. 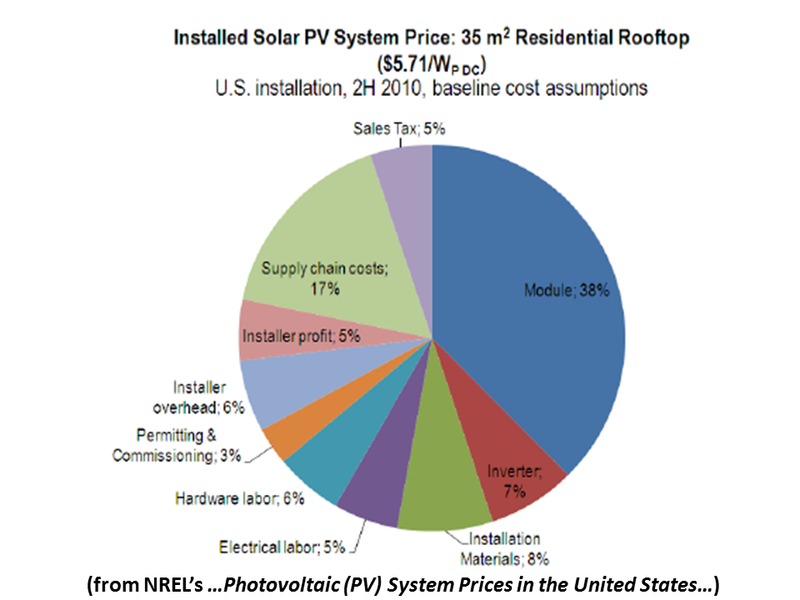 These results are intended to depict the installed price2 for U.S. PV systems in the second half of 2010, i.e., the unsubsidized cost (cash purchase) of the system from the owner’s perspective. 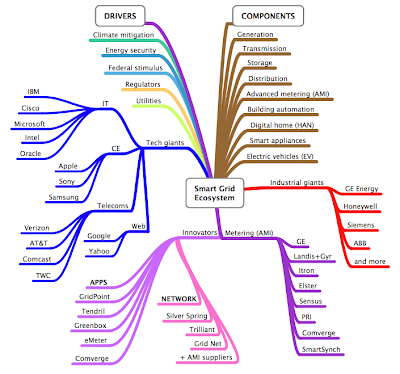 For each system type, the major cost drivers are identified, and the sensitivities to key assumptions (e.g., module efficiency, system scale) are presented. Following the benchmark system price analysis, this report presents results of a bottom-up analysis of potential PV system price reductions through 2020, assuming an evolutionary path of technological and market improvement. 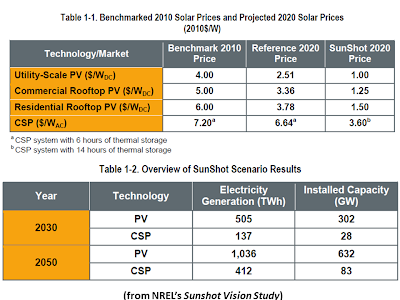 These projections are compared with the 2020 system price targets established under the SunShot Initiative. 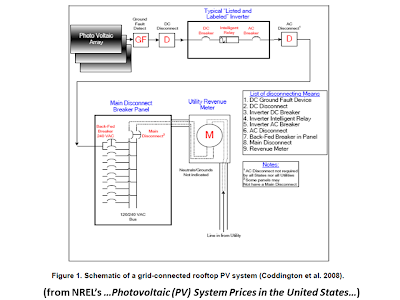 The difference between the evolutionary projections and SunShot targets highlights the need for innovative system designs and installation methods to complement module-level cost reductions. Because of the rapid U.S. PV system cost reductions resulting from global module price declines, market price data have become insufficient for providing policy makers and industry stakeholders with an accurate and current understanding of system-price drivers. A time-lag effect and the dynamics of a nascent industry disconnect reported system prices from underlying system costs. 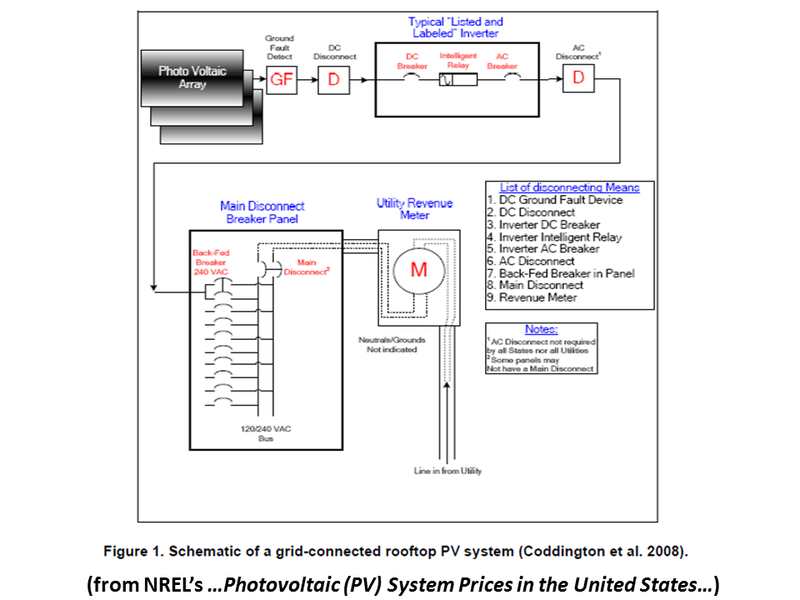 This report shows an objective methodology for approximating the underlying costs of PV systems with the resolution necessary for understanding system price drivers. 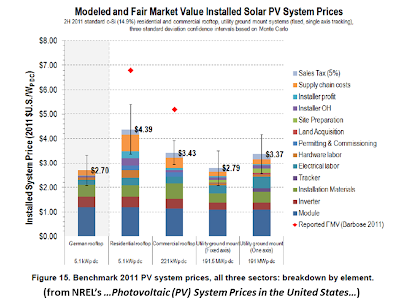 Comparing these objective values with market price data provides valuable insights into the U.S. PV market’s inefficiencies, which may be useful for developing policies and practices that address these inefficiencies. 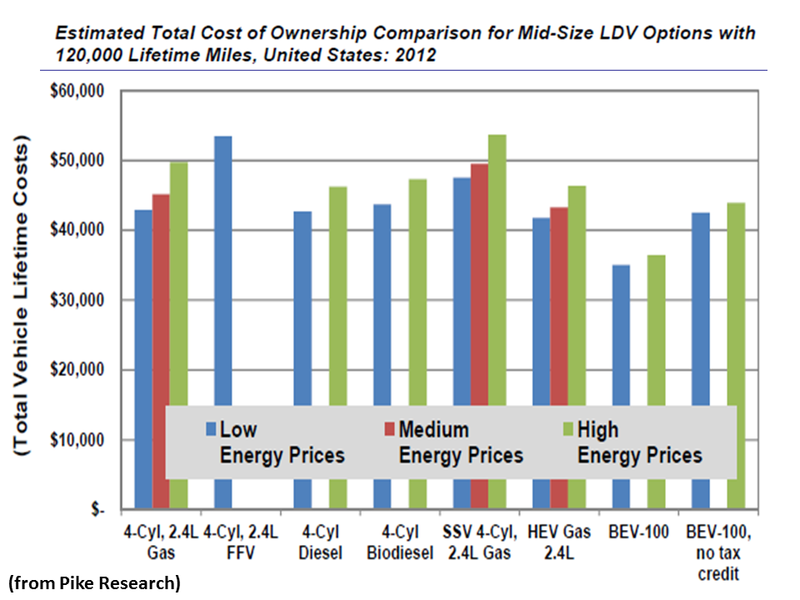 Understanding the forces driving PV system price reductions—and their limitations—is also important. The price of U.S. PV systems has fallen by nearly 30% since the second half of 2010, and further near-term price reductions are likely as the U.S. market matures. 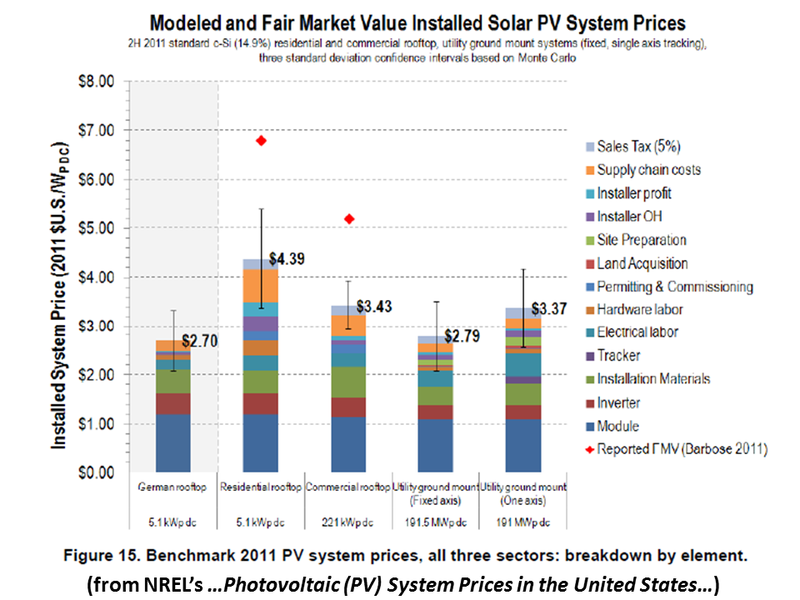 Most PV system components are based on commodities that have global prices. Thus, installation costs are largely responsible for the disparities in PV system prices among different countries and regions. The diffusion of installation knowledge and expertise throughout the U.S. market, increased local competition, and consolidation of U.S. installation companies should reduce these disparities substantially. Based on evidence from the more mature German PV market, factors such as improved installer productivity, reduced installer overhead and profit (due to competition), lower supply chain costs, and lower regulatory costs could reduce 2011 U.S. benchmark PV system prices by an additional 40%. The tight polysilicon supply and high prices during 2007–2008 may also help reduce PV system prices in the near term. Polysilicon is the feedstock for the dominant c-Si PV technology. The recent price spike caused new entrants to build polysilicon production facilities, many of which are now coming online. The resulting overcapacity of polysilicon—along with weakening European demand for c-Si modules—has driven polysilicon contract prices down by more than half compared with contract prices in 2008. 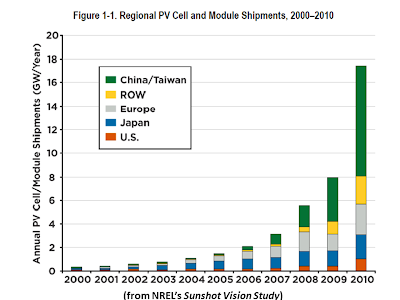 In addition, the 2007–2008 polysilicon shortage encouraged larger-scale production of thin film alternatives to c-Si PV, which also has contributed to lower global PV module prices. At the same time, the larger polysilicon production base has reduced the likelihood of another polysilicon shortage/price imbalance as severe as the one in 2007–2008. The abovementioned factors likely will contribute to lower U.S. PV system prices in the coming years. This report provides detailed roadmaps to evolutionary c-Si PV system price reductions and performance improvements, including substantial reductions in module and non-module costs. By 2020, these roadmaps would enable U.S. PV systems to approach—but not meet—DOE’s SunShot Initiative price targets. To accelerate PV price reduction toward meeting these aggressive targets, revolutionary improvements to module and non-module system components and installation methods are needed. "…Congressman Mike Thompson (D-Calif.) joined [retired Marine Corps Lieutenant General John Castellaw; Mike Breen, vice president of the Truman National Security Project; and Jeff Duff of Airstreams Renewables, a company that makes a point of hiring veterans] to talk about the importance and urgency of extending the federal Production Tax Credit (PTC) for wind energy… The group discussed how critical renewing the PTC is to America’s economic and national security. "The PTC, they said, is an important federal policy incentive without which 37,000 jobs and $10-20 billion of domestic investment would be lost next year and thereafter…"
"Wind power is a critical part of America’s energy independence. The growth of wind energy, which produces enough electricity to power 12 million homes, has been fueled by the PTC, wind power’s primary, performance-based policy incentive…Breen, who served in both Afghanistan and Iraq...[said the U.S. would] need sources of energy [it] can rely on in the 21st Century…"
"…[T]he growing interest in smart cities and communities is putting the spotlight on the smarter government operations that must guide their development. Smart government can be defined as the use of innovative policies, business models, and technology to address the financial, environmental, and service challenges facing public sector organizations. Smart government encompasses strategy and policy definition, specific applications and technologies to help improve service delivery and the establishment of new platforms for communication, data sharing, and application development. "Smart government builds on the IT infrastructure investments made by the public sector over the last decade. Back-office systems have helped improve process efficiency and the integration of services. Front-office systems have been adapted to support multi-channel communication with citizens and a growing range of transactional services. Smart government continues this transformation and also embraces innovations happening in areas such as energy, transport, and waste management…"
"This Pike Research report analyzes the global market opportunity for smart government technologies. 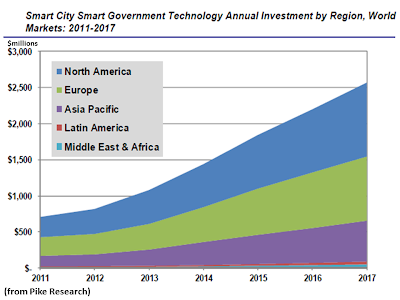 It assesses the business drivers, market forces, and technology trends that are transforming the use of ICT and related technologies in smart cities and communities. "The study forecasts the size and growth of the market for smart government technologies through 2017, and it also forecasts the growth in smart government data analytics and cloud-based services between 2011 and 2017…"
"The city of Los Angeles has more than 12,000 acres of prime space for solar development on the rooftops of local homes, businesses and multifamily buildings, with the potential capacity to create as much as 5 GW of locally generated power, according to a study by the Los Angeles Business Council (LABC)…[A] solar-ready rooftop space…equivalent to nearly 20 square miles. "The recent approval by the Los Angeles Department of Water and Power (LADWP) to move forward with the city's first feed-in-tariff (FIT) program - CLEAN LA Solar - provides the opportunity to create the first 150 MW of rooftop solar in the next three to four years, with a goal of reaching 600 MW by 2020." 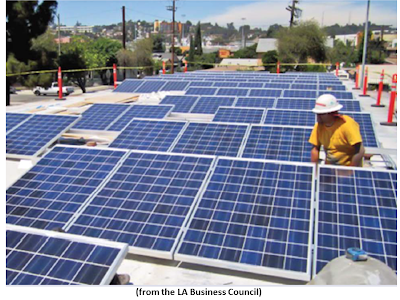 "…[LA] must meet a state mandate requiring local utilities to generate 33% of their power from renewable sources by 2020. The solar FIT…[is expected] to help the utility meet that goal…in the limited time frame…"
“… Despite [a rush of new solar producers, including China, solar module oversupply, pressure on margins, demand exceeding supply, and governments scaling back solar support in the aftermath of the economic crisis], new McKinsey research indicates that the industry is suffering from growing pains rather than undergoing death throes. Solar is entering a period of maturation that, in just a few years, will probably lead to more stable and expansive growth for companies that can manage costs and innovate to tap rising demand from multiple customer segments. “The Crown Estate, which controls the UK's territorial waters…plans to open up test sites in deeper waters in the North Sea… as part of the UK's study into lowering the cost of energy for offshore wind. ”The Japanese government will provide assistance to eight cities that were heavily damaged in last year's earthquake and tsunami to rebuild using ‘smart city’ technologies that use IT to cut dependence on traditional power sources. “Japan is investing heavily in infrastructure projects that seek to use advanced networking technology along with power grids to efficiently track and control electricity use. Such infrastructure, which includes Internet-connected power meters in homes, and giant electricity "routers" that control where power is sent, is considered a key building block before alternative energy sources like solar panels and wind turbines can be used on a large scale. 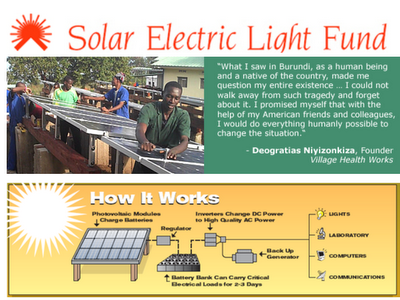 “…Many of the world’s poorest people are rural farmers with no connections to power grids or large-scale energy sources. Most of their day-to-day energy currently comes from the burning of wood and charcoal, practices that contribute to air pollution, deforestation, and the loss of precious time and energy collecting firewood…[but] five sources of renewable energy…are [also]…allowing them to improve their harvests and their lives. “2. Wind Energy: …The organization Practical Action…helped villages in Sri Lanka install a wind turbine that provides electricity for the entire community…Villagers pooled their resources to install and manage the turbine…and as a result a number of steady jobs are created. Installing a local turbine also means people no longer have to travel long distances and pay large amounts to recharge batteries that they regularly use. Candidate Romney’s Energy Plan; Romney accuses the Obama administration of having an “unhealthy obsession with green jobs.” Here’s the Romney platform. 75,000 jobs is an unhealthy obsession? 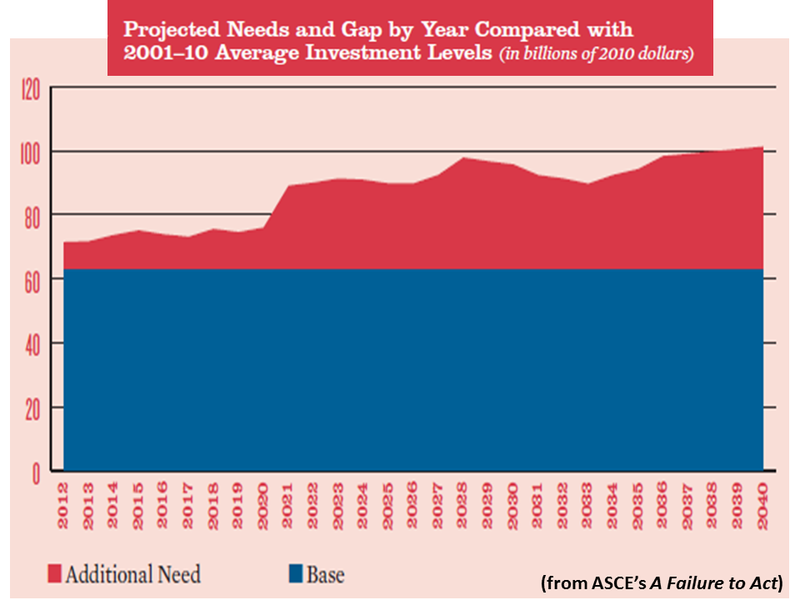 US Grid Has $107B in Investment “Gaps” by 2020; The American Society of Civil Engineers finds that failing to spend on grid upgrades will end up costing U.S. homes and businesses nearly $200 billion by 2020. U.S. wind power installations took a pronounced upturn in 2011, and the year’s final numbers tell a multi-faceted story. 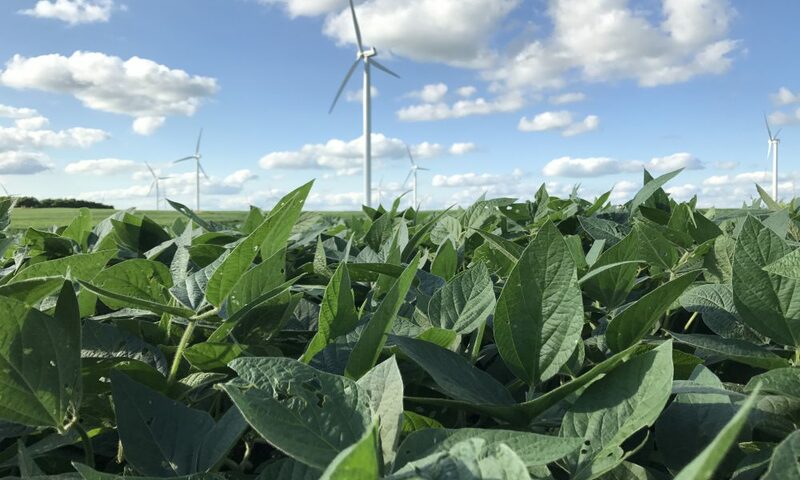 Wind energy is now firmly established as a mainstream energy source, with a growing domestic manufacturing supply chain and ever-improving technology that has made U.S. wind power more competitive than ever. Technological innovations and growing a domestic supply chain are pushing wind energy further down the cost curve. In addition to its other unique benefits, wind energy has zero fuel costs and locked-in electricity prices for decades. The U.S. industry’s continued march forward, evidenced by over $13 billion in investment in 2011, is particularly impressive given the short-term policy uncertainty under which the industry is currently operating. 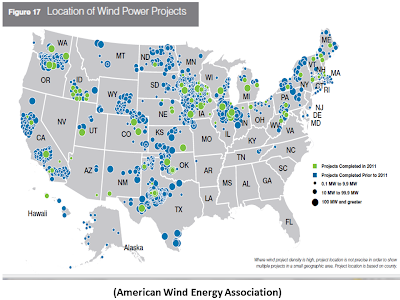 In 2011 the wind industry installed 3,464 wind turbines across 96 wind projects for a total of 6,816 megawatts (MW) deployed in the U.S. Despite challenges associated with policy uncertainty, a recovering economy, weak power demand, low electricity prices and dipping natural gas prices, the wind industry saw a 30 percent increase in new installations compared to the 5,214 MW installed in 2010. 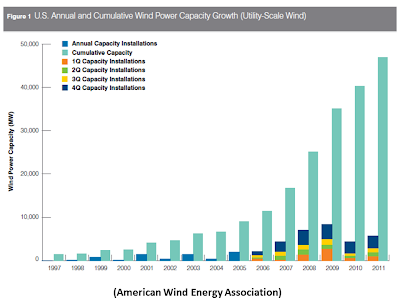 Megawatts added in 2011 put total U.S. wind installations at 46,916 MW, a 17 percent increase that keeps the industry in the double digits for overall annual growth. 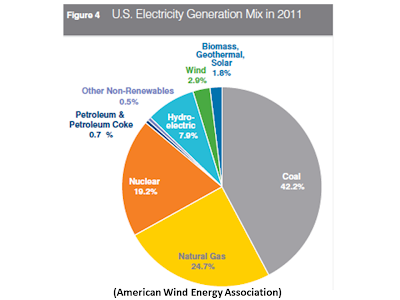 Now at 2.9 percent of the overall U.S. generation mix as of 2011, and meeting over 10 percent of the electricity demand in five states, electricity from wind power capacity in the U.S. can supply the equivalent of the electricity used by over 12 million American homes. 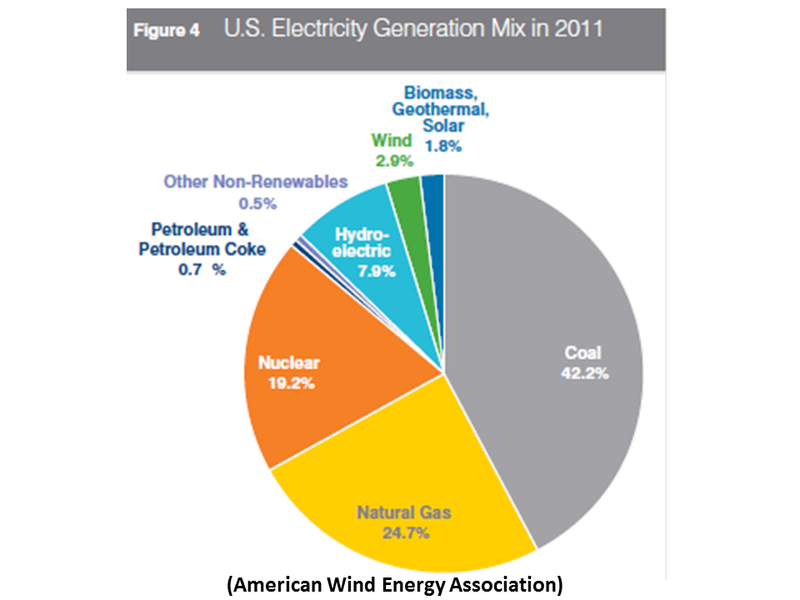 Wind power comprised 31 percent of all new generating capacity deployed in 2011, second only to new natural gas. That contribution marks a continuation of a lasting trend, as wind has installed 35 percent of all new capacity over the past five years. Even with wind energy’s impressive growth rate here, which has now lasted years, America has barely begun to tap its wind resource. The country’s wind resource is as diverse as it is great, with the 10 million MW of wind potential in the U.S. spread uniquely across the country. The most active states in 2011 for most megawatts of new installations were California, Illinois, Iowa, Minnesota, and Oklahoma. 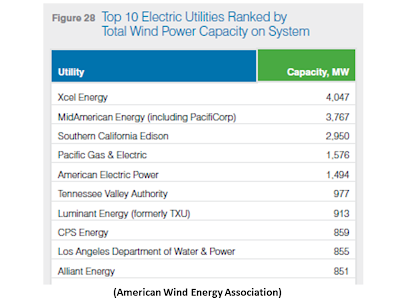 While some long-time staple states in the wind industry installed the largest number of megawatts, states seeing the largest growth rates in 2011 tell a different story: Ohio, Vermont, Massachusetts, Michigan, and Idaho all more than doubled or nearly doubled their installed wind capacity in 2011 alone. And Kansas is setting the stage for a strong 2012 with the most new capacity under construction of any state in the U.S. The evolution of wind energy technology is evident just in turbines’ nameplate capacities. The average turbine size, after years of steady increases, jumped further in 2011 to nearly 2.0 megawatts (MW) in 2011, up from 1.77 MW in 2010 and 1.48 MW in 2005. 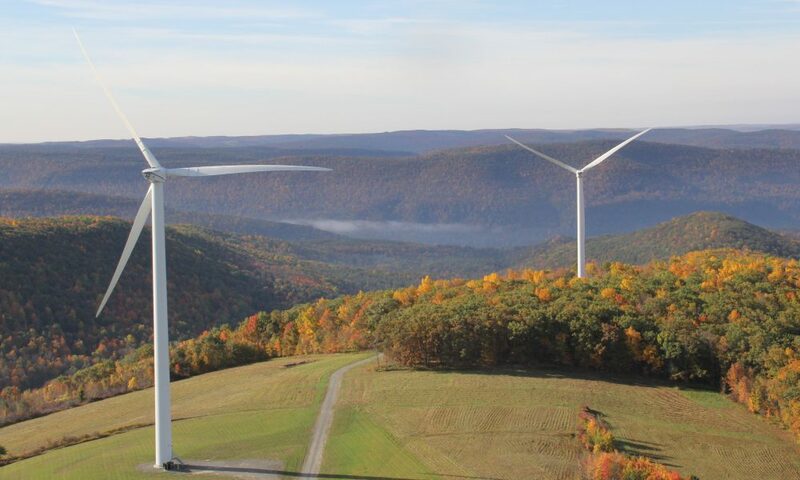 A closer look at those turbines reveals characteristics that have been critical factors in another industry trend: wind power’s ability to access new regions and markets. 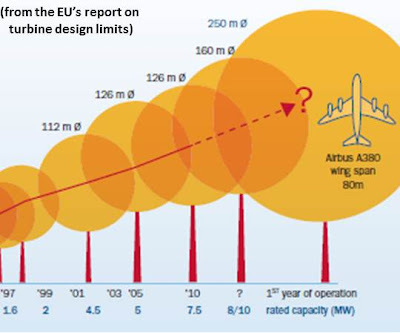 Tower heights and rotor diameters (wingspan of the blades) are rapidly increasing, allowing developers to access better winds and capture more energy in areas previously not considered to have ideal wind resources. While the average hub height is 81 meters, hubs rising to 100 meters-plus—a threshold reached only in recent years—already comprises 5 percent of all turbines installed during 2011. The top end of turbine rotor diameters also demonstrates wind’s continued progress; rotor diameters for turbines installed during 2011 averaged 92 meters, while over 55 percent of turbines installed have rotor diameters of 90 meters or greater, and nearly 23 percent of turbines are at 100 meters or greater. This technological evolution is directly related to the advancing domestic turbine market and an increasingly made-in-the-U.S.A. wind manufacturing supply chain. The turbine market saw continued diversification, with 23 active turbine manufacturers installing 31 turbines with different ratings during 2011, up from only 5 turbine manufacturers in 2005. The U.S. wind supply chain that supports these turbine manufacturers already has a strong foothold in the U.S.: over 470 wind related manufacturing facilities, representing 30,000 wind manufacturing jobs, are now spread across the country. The growing manufacturing capacity here is reflected in the increasing domestic content of turbines, with 60 percent of U.S.-deployed turbines’ value being manufactured domestically in recent years (2009-2010), up from less than 25 percent prior to 2005. 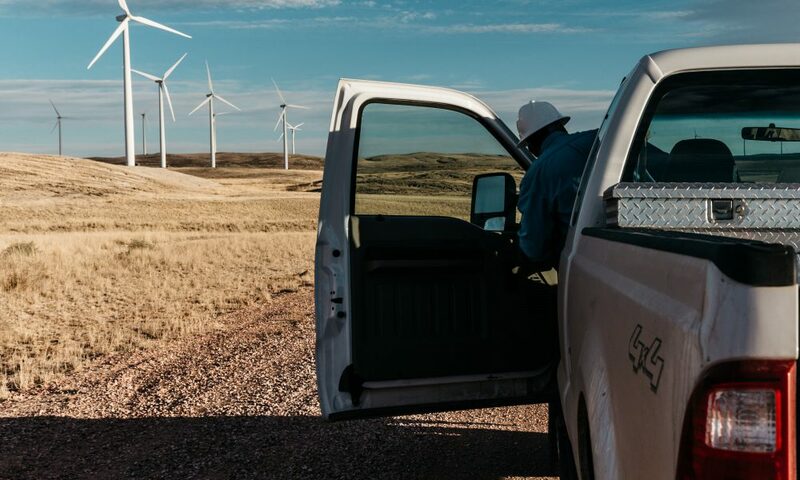 As wind energy slides down the cost curve and provides a stable-priced product for electricity consumers, electric utilities continue to show increasing interest in including wind energy as part of their power portfolio. One example: When utility Xcel Energy secured a wind power purchase in 2011, in approving the contract, the Colorado Public Utilities Commission stated that “the contract will save ratepayers $100 million on a net-present-value basis over its 25-year term under a base-case natural gas price scenario” while providing the opportunity to “lock in” a price for 25 years. 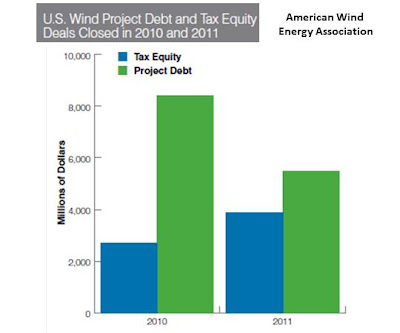 In 2011, electric utilities signed at least 39 new long-term power purchase agreements (PPAs) for wind energy. Direct ownership of wind projects by utilities, meanwhile, increased in 2011 to reach 25 percent of all new wind capacity, up from 15 percent in recent years. Between new PPAs and direct ownership of wind power by electric utilities, 79 percent of all new wind capacity in 2011 was secured by some form of long-term power off take. As electric utilities expand their use of wind power, the transmission grid is also expanding. Progress was made in 2011, with new transmission lines being completed and revised rules helping expedite the process of integrating wind into the power grid. In coming years, several new transmission lines are planned that will be able to carry more than 44,600 MW of new wind power. The U.S. wind power industry’s greatest challenge for 2012 is one with which the industry has lived for some time: short-term, unstable policy. 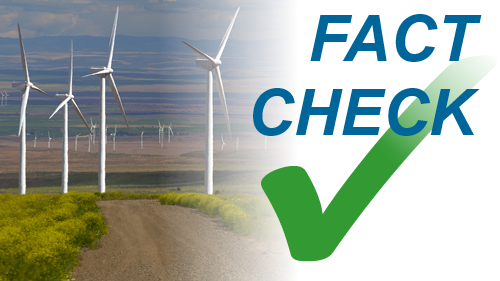 The federal Production Tax Credit (PTC), a performance-based tax credit for kilowatt-hours produced by a wind farm once it is built, has typically been extended in only one- and two-year increments. The history of the PTC proves its effectiveness as a driver of billions of dollars of investment in the U.S., in the form of both project development across rural America, and a growing manufacturing sector for wind turbine components. Stable policy—in the realm of what other energy sources have received for 90 years or more—would send the proper market signal that would allow U.S wind power to flourish to an even greater extent. While federal policy uncertainty still holds back the U.S. industry, other stable policy drivers remain in place. 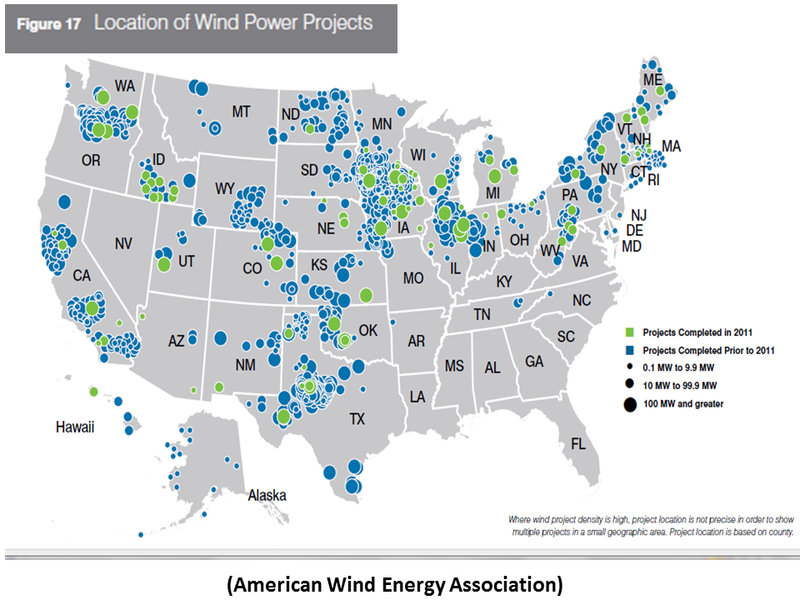 State targets for renewable energy continue to drive wind installations in many areas of the country. As many as 29 states have renewables requirements, and still more states have renewables goals. California leads the way in this area; in 2011, the governor of California signed into law legislation that increases the state’s renewable electricity standard from an already strong 20 percent to an historic 33 percent by 2020. The industry closed out last year with numbers that suggest a strong 2012, with 8,300 MW of wind power under construction as the year began. 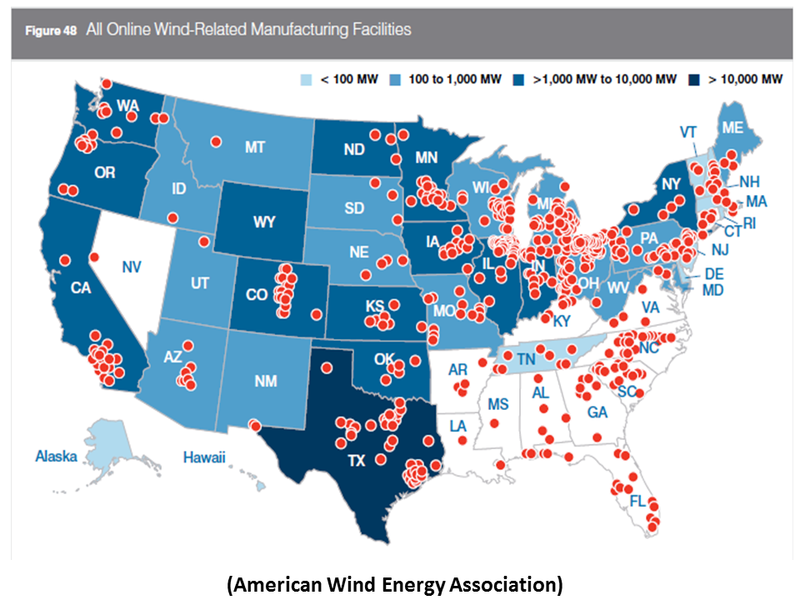 Meantime, with wind power now established as a mainstream energy source, the U.S. industry is ready and able to continue boosting the economy with investments in new projects across rural America, and greater demand for the supply chain that will expand this bright spot in America’s manufacturing sector even more. 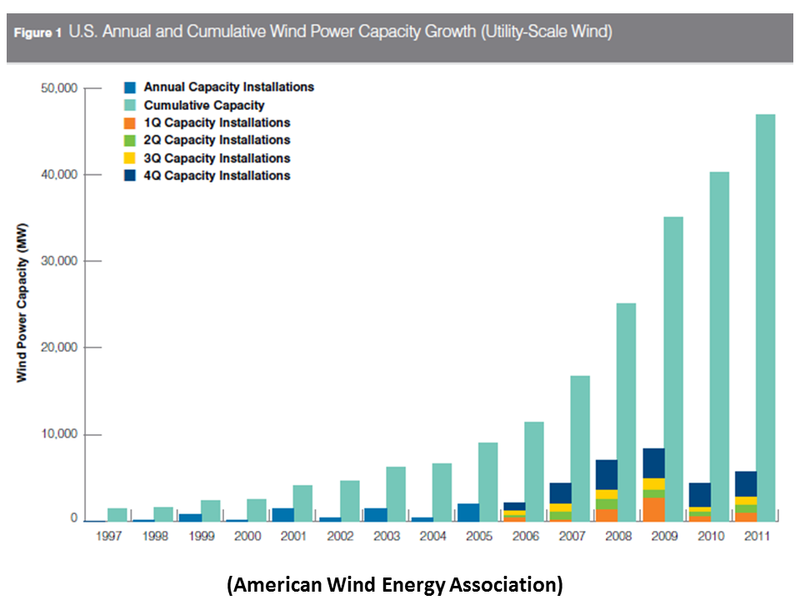 The wind industry installed 6,816 MW in the U.S. in 2011, over a 30 percent increase over the new wind capacity installed in 2010. 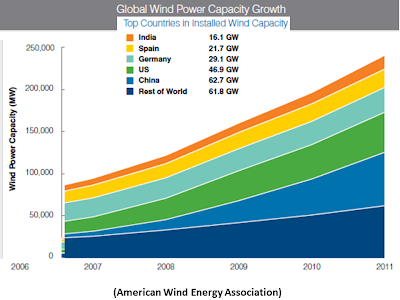 The wind power capacity added in 2011 represents a solid 17 percent growth in total U.S. wind installations, which now stand at 46,916 megawatts (MW). The industry’s average annual growth for the past five years is now 33 percent. Equally impressive: electricity generated from wind power capacity in 2011 in the U.S. can supply the equivalent of over 12 million American homes. 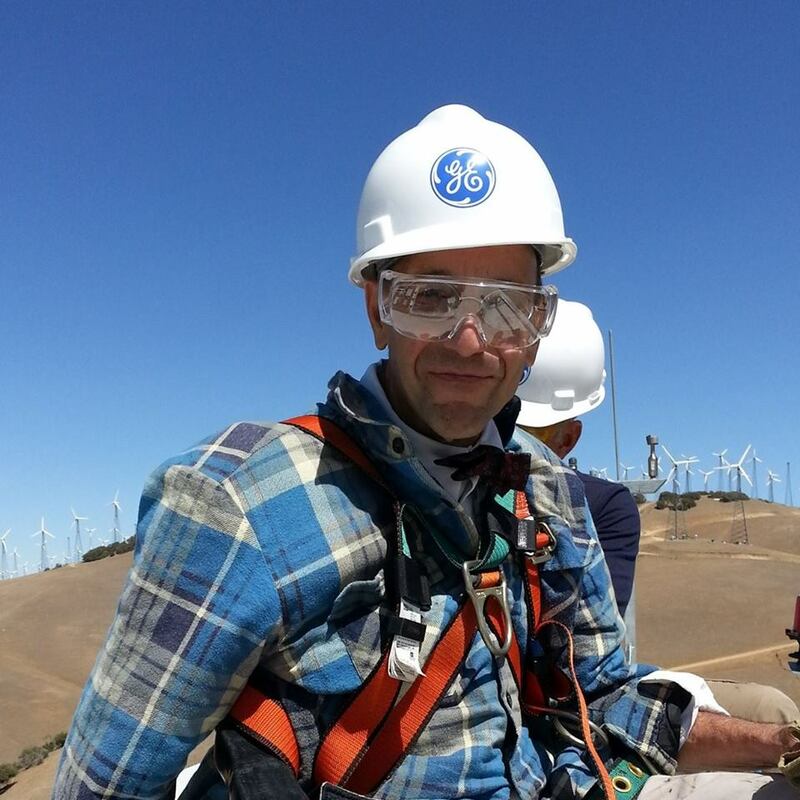 Driving the growth of any industry is the customer; in wind power’s case, that customer is the electric utility. Tellingly, the number of signed wind power purchase agreements was up in 2011, with an increasing number of utilities being attracted to (and publicly acknowledging) the benefits of the wind power. Unlike other forms of generation, wind power comes with affordable, guaranteed prices for a period of timing spanning decades. Wind power is immune to fuel price volatility, providing stability and risk protection within utilities’ portfolios; more than ever utilities are drawn to wind power because of these attributes. Because wind power is affordable and secure, 2011 saw PPAs being signed all over the country, even in regions where those unfamiliar with wind power might have assumed the clean, affordable energy source would be less likely to be used. In 2011, Alabama Power, a subsidiary of The Southern Company, made its first wind power purchase. To understand the scope of wind power’s growth and the achievements made by the maturing, now-mainstream industry during the last few years, it’s useful to look back and consider wind power’s growth numbers from when it was a mere emerging technology. 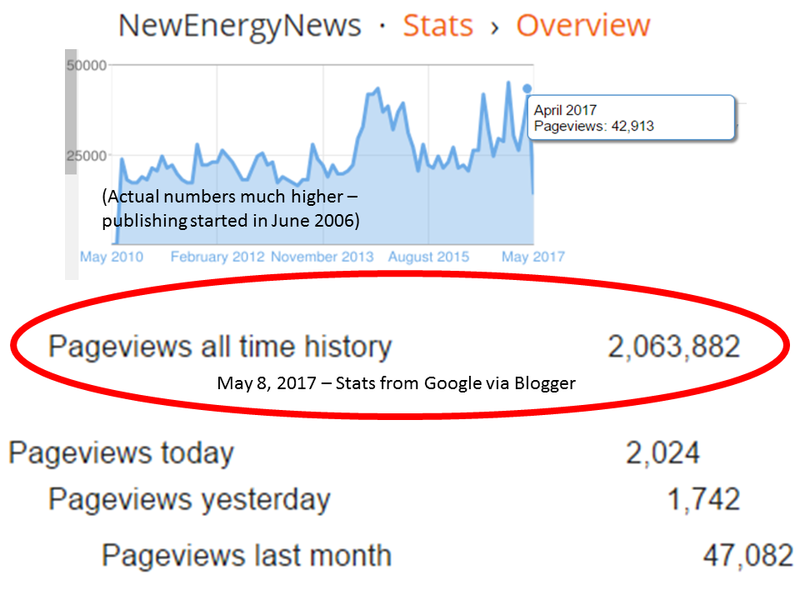 It took nearly 25 years for the industry to reach 5,000 MW of capacity, from the early 1980s to 2003 (6,226 MW at the end of that year). That’s when wind power truly took off. 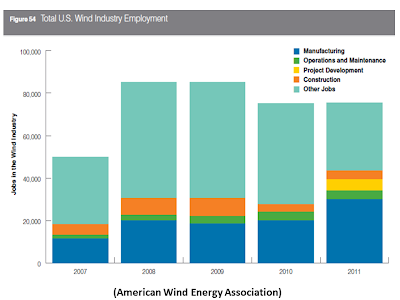 After 2003, U.S. wind installations doubled in just three years, with the industry celebrating the milestone of exceeding 10,000 MW in 2006. From there, the industry showed that it had only begun to ramp up. Within a mere two years, installations had doubled again, to 20,000-plus MW by 2008 and then, remarkably, two years later installations doubled still again, with 40,000 MW online by 2010. 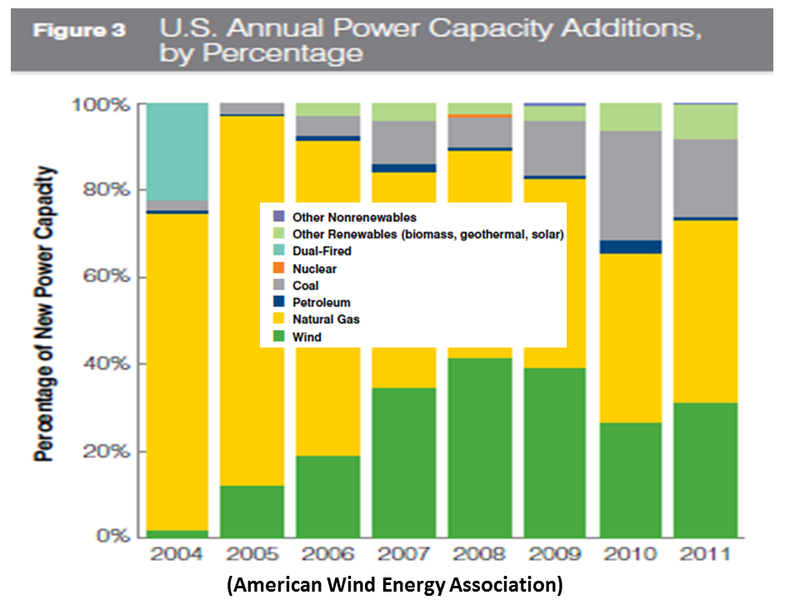 In just a few short years, wind power had become a major player on the energy landscape. In 2011, with another year of solid installation numbers under its belt, the industry further cemented itself as a primary contributor to the mix for newly installed electric capacity, accounting for 31 percent of all new generating capacity in 2011. 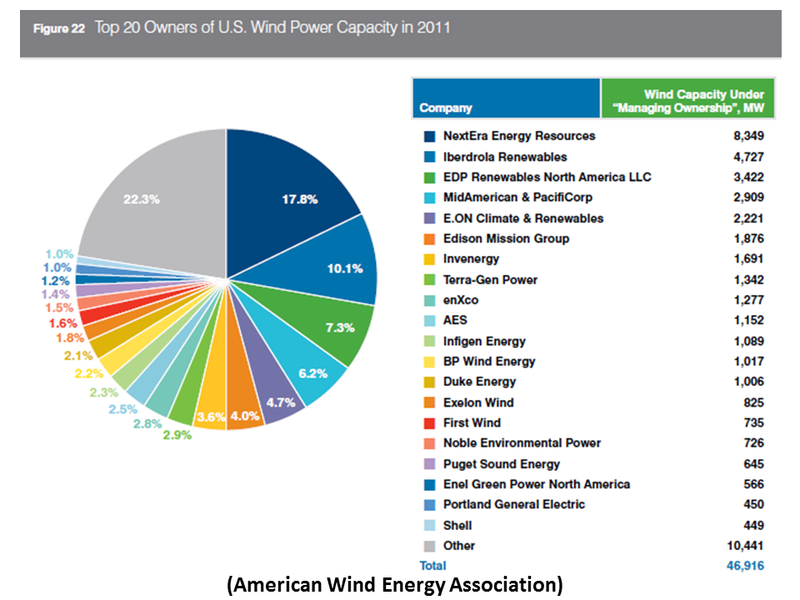 The U.S. wind power industry installed 3,446 MW in the fourth quarter, representing over 60 percent of total 2011 installations. 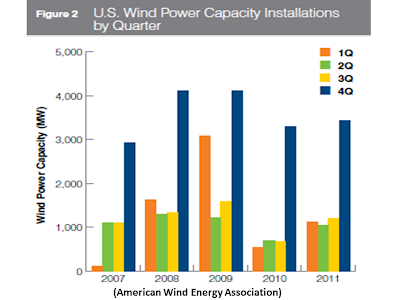 The fourth quarter performance slightly exceeded the installations in the same period in 2010, and outpaced the first three quarters of 2011 combined. 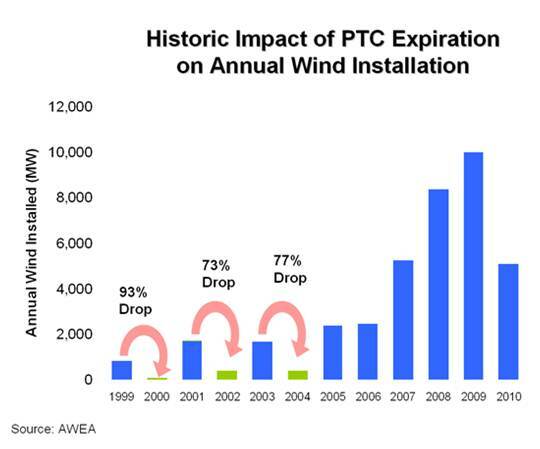 Strong fourth quarters are typical in the wind industry for reasons that include seasonal weather (i.e., developers want to finish projects before winter), the general business cycle and, in many years, impending expirations of the federal wind tax credit at the end of a given year. New wind power capacity continues to make up a large share of all new generation in the U.S., second only to natural gas. 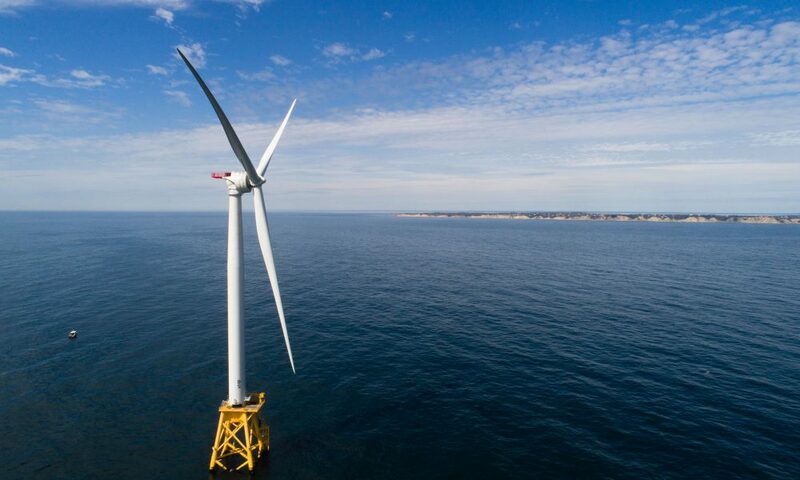 The natural gas industry installed nearly 42 percent of the year’s new electric generating capacity while wind power followed at roughly 31 percent, up from 26 percent in 2010. 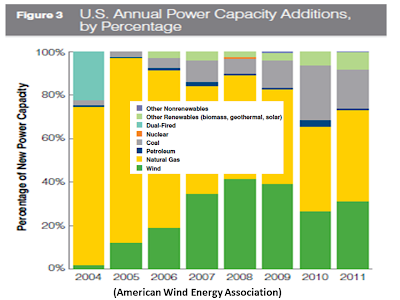 Over the past five years, between 2007 and 2011, wind installed roughly 35 percent of all new generation capacity in the U.S.
All renewable capacity (wind, solar, biomass geothermal, and hydropower) combined for roughly 39 percent of all new generating capacity installed during 2011, similar to the amount of new natural gas added during the year. SOLAR SHAKEOUT Surviving The Shakeout: With PV Stocks Plunging, Where Are We Headed? “…[T]hin-film PV manufacturer First Solar…[anounced it] would cut 2,000 jobs and shut down its manufacturing operations in Germany …[and] the company's stock hit an all-time low as analysts questioned its core business model in an era of low polysilicon prices…[M]ost analysis indicates that First Solar's woes are representative of a broader corporate-finance trend in the solar sector. While many companies will survive and emerge as more competitive players, the worst may be yet to come for others. “Goldwind is working on a 10MW turbine according to its annual report for 2011…Technically, this makes Goldwind the second manufacturer to be working on a 10MW turbine. Last year Sinovel also said it was developing one although it is believed this was largely based on AMSC's SeaTitan design. 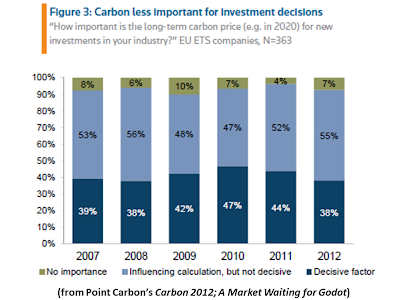 This year’s survey shows that in the EU ETS, the low carbon prices lead to emission reductions in fewer of the companies covered by the scheme and that the carbon price is a less decisive factor in investment decisions than previously. This underpins the need for political action, either through a deepening of the EU wide emission reduction target or through a reduction in the amount of allowances distributed to EU ETS companies. These issues are at the centre of discussions in the European Parliament, among member states and in the European Commission. 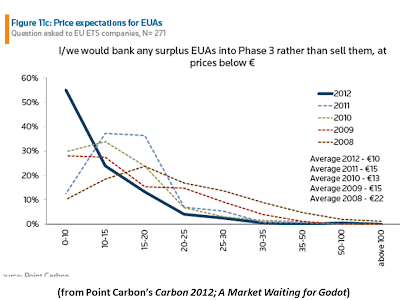 This will be the main policy issue to drive carbon prices in Europe this year. 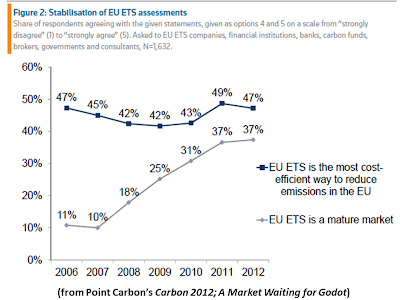 The assessments of the EU ETS cost-effectiveness and maturity show a stabilisation – this is also likely related to the current low price levels, as well as to thefts from registries in early 2011 and to the changes to the scheme which will kick in next year, when the programme enters phase 3. 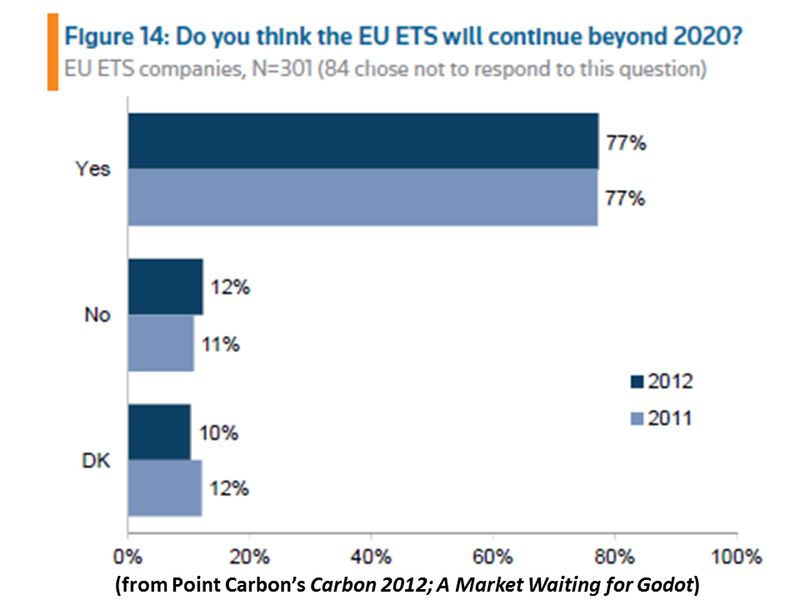 Forty-seven percent of respondents think the EU ETS is the most cost-efficient way to reduce emissions, and thirty-seven percent agree with the statement that the EU ETS is a mature market. 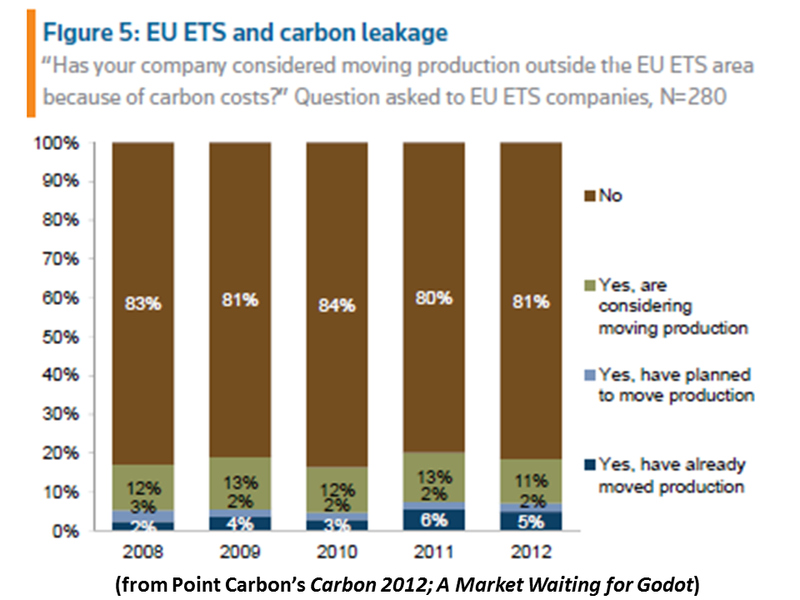 The EU ETS continues to be seen as more cost-effective and mature than the CDM. For instance, 36 percent of respondents think the largest Kyoto flexible mechanism is the most cost-effective way to reduce emissions in developing countries. Assessments of the CDM are more positive than last year, and this is 5 percentage points up from the 2011 survey. As much as 28 percent agrees that the CDM market is mature – up from 19 percent last year. We think that the more positive assessments of the CDM come from more efficient project registration and issuance by the UNFCCC, greater use of standardised baselines and default values, and more frequent use of stakeholder consultations by the CDM Executive Board. On a more negative note, the outlook for CDM investments and trading of CERs is gloomy. Much higher shares than last year plan to decrease or completely stop investing in CDM projects, trading primary and secondary CERs. These results are not surprising in a context of a bearish price outlook and poor outlook for demand for credits towards 2020. 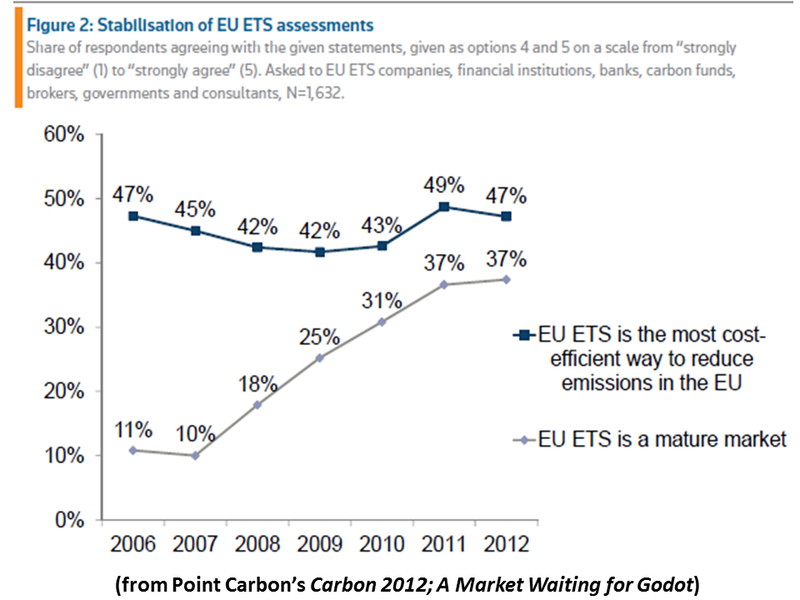 The results also show that the EU ETS restrictions on international offsets in phase 3 are starting to bit on investment plans. In North America, of the respondents voicing an opinion, more thought that regulators will tighten the Regional Greenhouse Gas Initiative’s cap in the coming years than did not. However, even more respondents didn’t know or had no opinion on whether the cap will tighten, reflecting the state of uncertainty around the future of RGGI’s current over-allocation. In California, emitters prepare for the cap-and-trade scheme starting in 2013 mainly through preparations for allowance and credit purchases. A large majority of emitters in California participating in the survey have no plans to move production out of the state due to carbon costs. However, one fifth of respondents covered by the upcoming cap-and-trade scheme in the Golden State are considering to do so. Nearly 70 percent of respondents in Australia think the national carbon scheme will go ahead as planned, while a quarter think it won’t. This may reflect concern over threats from the opposition to dismantle the scheme if they win the elections in 2013. We think that the “flexible price” period of the carbon scheme will start as planned on 1 July 2015, but there may be changes to the price floor and ceiling. Moving to the international scene, respondents were somewhat more dissatisfied with the outcome in Durban than in Cancun. Nearly forty percent of respondents think the global policy framework after 2020 will be a pledge-and-review system. Under such an international set up, countries pledge emission reduction targets reflecting decisions at national level, and the UN Convention on Climate Change merely gathers these pledges and coordinates reporting of emissions - without a Kyoto like compliance regime. Meanwhile, thirty-four percent of respondents think there will internationally binding targets for major emitters post- 2020. Finally, 18 percent think that countries will fail to agree. FOREWORD As the California Air Resources Board (CARB) completes the final preparations for distribution of CO2 allowances to the State’s largest industries, including an auction of about 10% of the allowances in the first compliance period under a broad cap and trade regulation, opponents of climate action are converging on Sacramento. Some object to having to buy allowances; others want to eliminate or expand the ability to use offsets; a few even question the need for action, citing continued challenges to the science of climate change or the perceived unfairness to California residents of placing a price on carbon when other states and countries are doing nothing. In the face of a new round of well-funded efforts to overturn the program, renewed efforts are underway to educate policymakers, businesses and consumers about what to expect and why cap and trade makes sense. This is no easy task. While most voters understand that climate change is a real threat, and many are willing to support action, few people can explain cap and trade and even fewer believe it’s the best way to reduce greenhouse gas emissions. So how do we go about building and maintaining the support necessary to carry us through the start-up of this new venture? First and foremost, we are working on our own and with our partners in the Western Climate Initiative to make sure that when the (imaginary) bell rings for opening day there are no administrative glitches. We have carefully studied the experience of RGGI and the EU ETS, both good and bad, as well as the cautionary tale of California’ disastrous experiment with deregulating electricity markets. Every aspect of allowance creation, tracking and use has been designed to deter fraud. We are retaining an independent market monitor whose job is to be on constant lookout for any symptoms of irregularity or problems in the trading of allowances that might be symptoms of abuse or market manipulation. A blue-ribbon market oversight committee will review and advise if action needs to be taken to correct problems. Our goal, of course, is to launch a system that runs smoothly, that achieves the stipulated reductions in greenhouse gas emissions at a cost that is acceptable to the general public and that fits well within a set of policies designed to encourage investment in energy efficiency, renewable electricity generation, and rapid adoption of advanced technology vehicles and fuels. Looking ahead, I see three major areas where we will need the help of creative business and financial thinkers. 1. Compliance-grade offsets. The demand for fully verified offsets developed under approved CARB protocols will grow quickly. The Board is eager to find offset types that fit our rigorous criteria. While there are no current plans to relax the geographic boundaries or numerical limits on offsets, these aspects will be under close scrutiny and may be revised if need be. 2. Voluntary offsets. As forward-looking businesses and state and local permitting agencies with responsibility for environmental impact review and mitigation begin to incorporate assessment of GHG emissions in all kinds of plans, project developers will need to find and lock in emissions reductions. Such offsets will be required both by law and public scrutiny to demonstrate that they are real, enforceable and exceed any current or likely future regulatory requirements. 3. Investment. Making sure that the benefits of free allowances and the proceeds of auctions are used wisely is emerging as a major political issue. Without losing the benefit of a price signal to those who can choose to reduce GHG emissions cost-effectively while at the same time protecting the general public against rate shocks requires careful calibration. For the public sector, the temptation to seize any new revenue to fill general budget holes may be irresistible. Any diversion of proceeds from the cap and trade program to non-AB32 purposes risks a judicial stop to the rule. 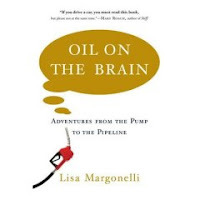 But there are ample opportunities to think creatively about using the robust new revenue stream that will start flowing when transportation fuels and natural gas come under the cap in 2015. We are already well into the last year of the EU ETS’ phase 2 and of the first Kyoto commitment period as this report is published. 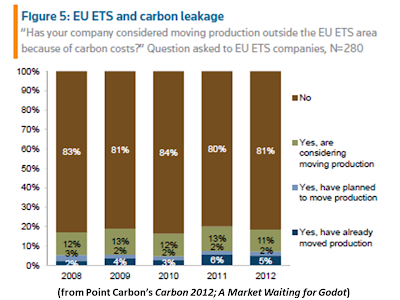 In the EU ETS, the largest carbon market segment, we expect increased market activity this year. Compliance entities optimise their portfolio as the end of phase 2 approaches, while utilities gear up hedging activity in anticipation of the need to purchase all allowances in the market from 2013. 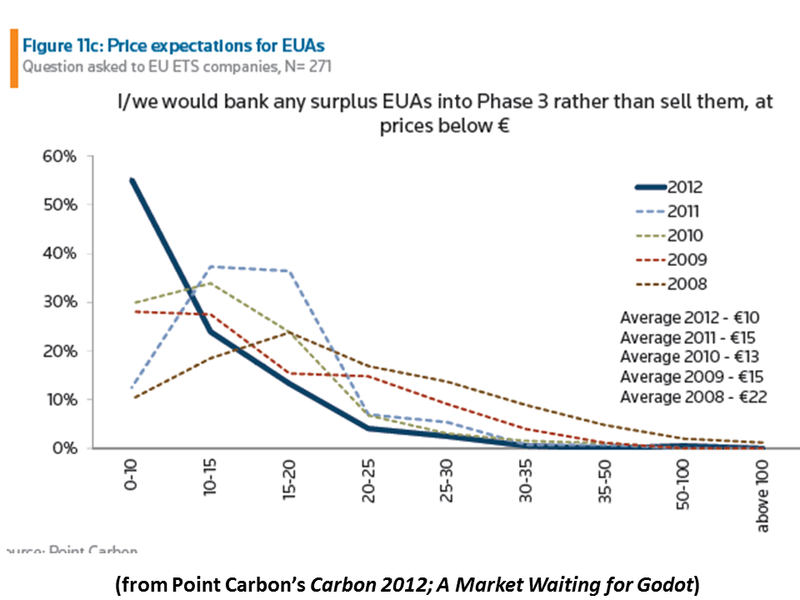 The discussion around a possible intervention in the EU ETS through a withdrawal of allowances from the market is heating up. In North America, Quebec and California work on the launch of their markets, planned for 2013. In this report, we present the results of our seventh annual Carbon Market Survey, which aims to gather the views of carbon market participants and observers across the globe. We have asked questions related to market participants’ behavior and expectations, tailoring questions based on each respondent’s market involvement. We cover the EU ETS, CDM, JI, New Zealand ETS, California and Quebec markets, emerging carbon markets in Asia and Australia, as well as international negotiations. Some 3 149 respondents answered this year’s survey, roughly 600 more than last year. The survey ran from 6 to 26 February 2012, and responses were garnered through a web based tool. Among the respondents, around half were involved in trading of various compliance carbon allowances and credits, or owned such instruments. 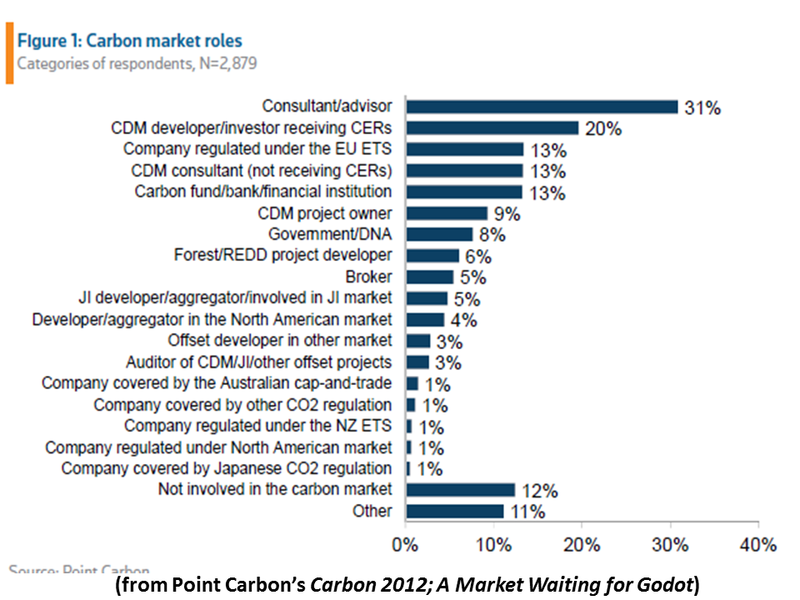 Looking at carbon market roles, the largest subset comprises consultants/ advisors (see Figure 1), while the second largest group was CDM project developers or investors (receiving CERs). 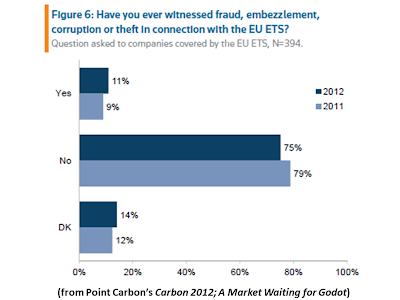 Companies regulated by the EU ETS represented the third largest group. 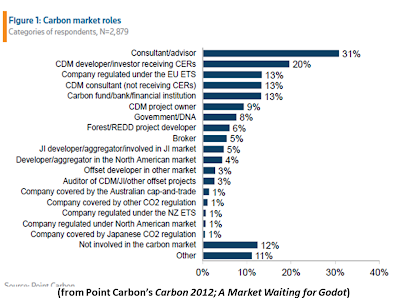 Twelve percent of the respondents were not directly involved in the carbon market. Looking at geographical origin, the US is again the home of the largest share of respondents, with 14 percent of the total. The next countries are the UK (10 percent), India (6 percent), Germany (5percent), Australia (5 percent), China (4 percent), Canada (4 percent) and Norway (2 percent). It should be noted that this survey is conducted among individuals that are significantly more than average interested in carbon markets and policy. THE BACKING FOR NEW ENERGY Clean-energy subsidies are vanishing. What should replace them? "The new report…is the first to examine in detail which policies are actually expiring and when. 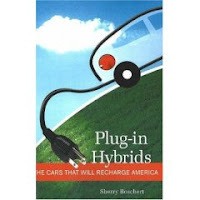 All told, Congress has created more than 92 different programs dealing with clean tech — everything from production tax credits for wind power to advanced manufacturing credits to loan guarantees for nuclear power…And, by 2014, 70 percent of these programs will have vanished." "[T]he report suggests that Congress should rejigger its clean-energy subsidies in several ways. First, it should focus heavily on research and development. And second, the subsidies that are geared toward deploying new technologies — the credits and policies that help wind turbines sprout up and nuclear reactors get built — should be structured so that they reward improvements in performance…[Feed-in tariffs] for wind and solar power that get smaller over time…[force] the technology to keep improving in order to stay profitable…The ultimate goal of these policies…is to push clean tech so that it can eventually stand on its own and compete with older, more established fossil fuels…"
UTILTIES STILL BUYING WIND Two utilities take different paths to the top in wind; MidAmerican Energy is building vast wind farms. Xcel Energy has mostly purchased its wind power. 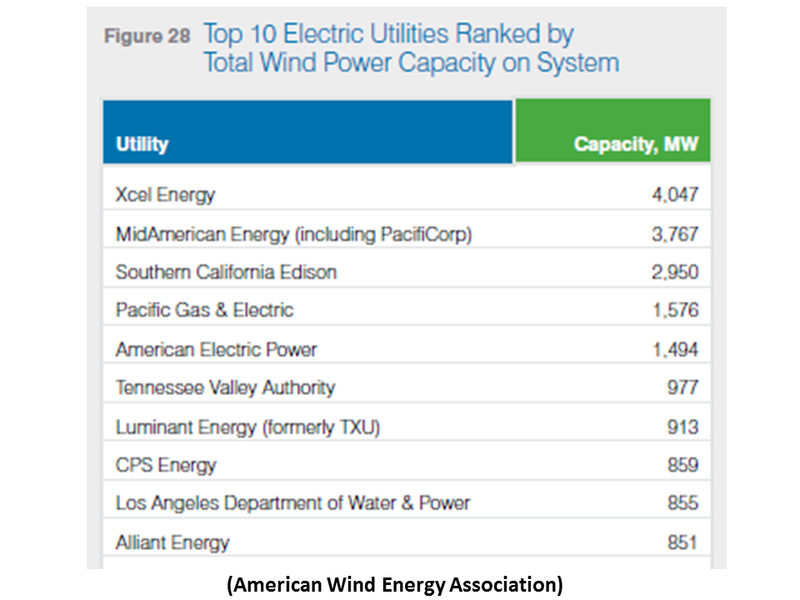 "Xcel Energy Inc… has the most wind power on its system of any U.S. electric utility…MidAmerican Energy Co…[is] the top utility in wind generation ownership…two distinct business approaches to harnessing wind power…MidAmerican owns almost all of its wind generation. Xcel…purchases much of its renewable power under long-term contracts from wind farm developers. "There are pros and cons to each approach, as utilities weigh whether to tie up capital in wind technology or let others take the risks…Together, Xcel and MidAmerican Energy have a 17 percent share of the nation's wind power capacity…Most utilities have gone Xcel's way…[because] the companies didn't have any experience with wind power, especially in the 1990s, and turned to companies specializing in the technology…"
"…[The ownership, risk-management] strategy is to take advantage of the federal production tax credit…and carefully manage wind power with the rest of the company's generation…The risk of future greenhouse gas regulation is another argument for owning, rather than purchasing, wind power…[But] wind power prices have been dropping. 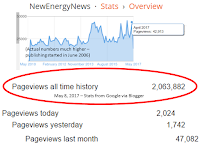 When Xcel faces the expiration of its first wind power purchase contracts in 2018, it's possible the utility could get a better deal on its next long-term contracts…[and] wind farms also will eventually need to be upgraded…But for a few years, after projects are paid off, wind farm owners could face only operation and maintenance costs…"
"PV equipment revenues (covering c-Si ingot-to-module and thin-film) for Q1’12 fell to $1.75 billion, a 10-quarter low, down 27% Q/Q and 51% Y/Y. However, the CapEx downturn is forecast to finally bottom-out during Q2’12, following six consecutive quarters of negative growth." "The rebound in spending will be characterized first by new order intake driven by a select group of tier 1 manufacturers. Positive Q/Q growth in new orders will emerge in 2H’12, as capacity expansion plans are revised to address market-share aspirations for 2013 and beyond. 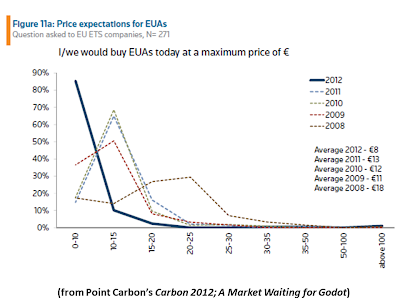 This will be reflected in PV book-to-bill ratios that will return above parity during 2H’12. "The severity of the cyclic spending downturn is having a dramatic impact on PV equipment suppliers in 2012. Most leading equipment suppliers are now projected to see Y/Y PV-specific revenue declines in the 60-80% range…Suppliers that already serve market segments adjacent to PV (semi, display, and LED) have experience in how to manage capital equipment spending cyclicality, so they will be best positioned to cope with the PV downturn during 2012. 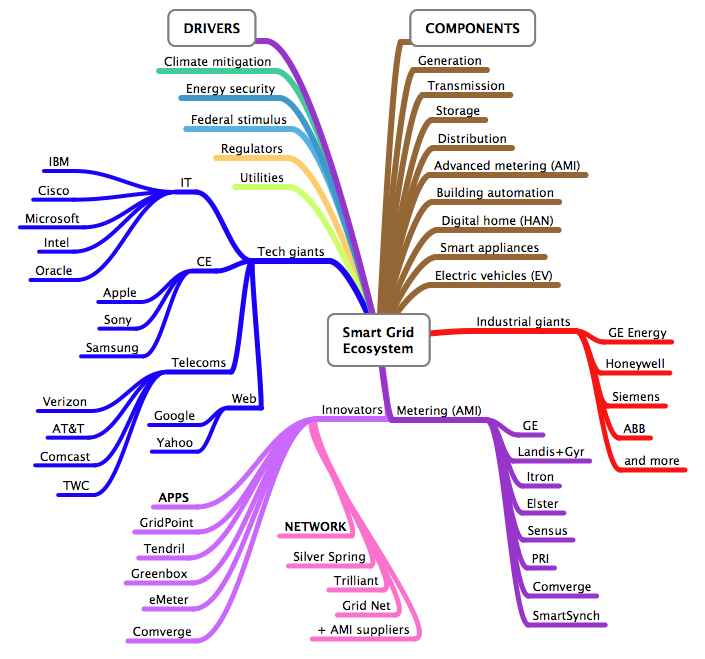 However, equipment suppliers that had aligned their core business activities to focus mainly on the PV industry will be particularly affected, with further workforce adjustments and negative operating margins likely…"
The objective of the SunShot Vision Study is to provide an in-depth assessment of the potential for solar technologies to meet a significant share of electricity demand in the United States during the next several decades. Specifically, it explores a future in which the price of solar technologies declines by about 75% between 2010 and 2020—in line with the U.S. Department of Energy (DOE) SunShot Initiative’s targets. 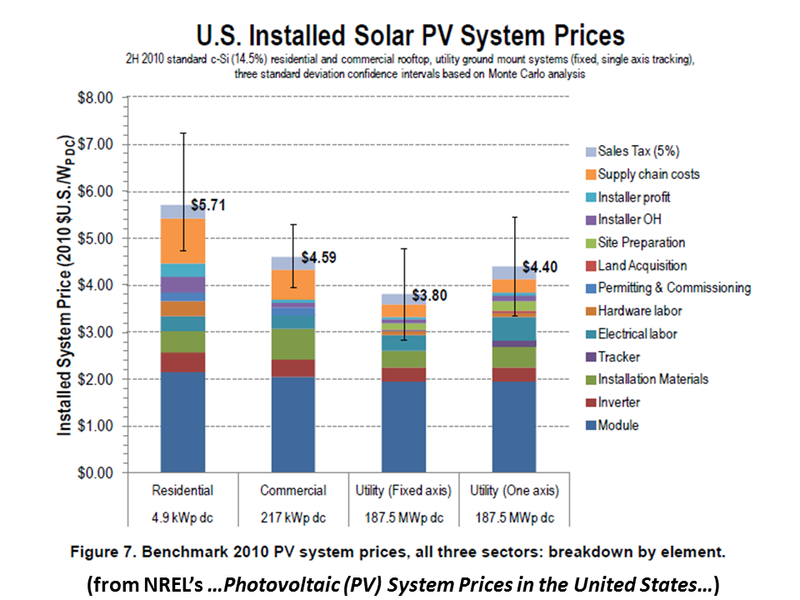 As a result of this price reduction, solar technologies are projected to play an increasingly important role in meeting electricity demand over the next 20–40 years, satisfying roughly 14% of U.S. electricity demand by 2030 and 27% by 2050.1 In terms of technology, the SunShot Initiative and this report both focus on photovoltaics (PV) and concentrating solar power (CSP). Details about how the SunShot Initiative is organized to achieve its targets and increase American competitiveness in solar energy can be found on the initiative’s website (www.eere.energy.gov/solar/sunshot/). 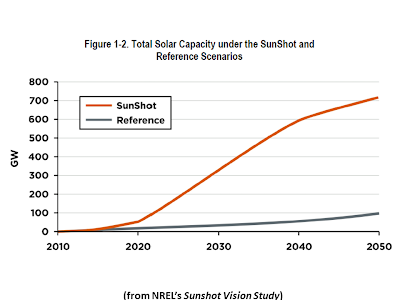 The SunShot Vision Study uses the National Renewable Energy Laboratory’s (NREL) Regional Energy Deployment System (ReEDS) and Solar Deployment System (SolarDS) models to develop and evaluate a SunShot scenario and a reference scenario. In both scenarios, the models are used to develop a least-cost geographical deployment of solar technologies and other generating technologies (conventional and other renewable). The scenarios assume the federal investment tax credit (ITC) and production tax credit (PTC) run through their currently established expiration dates—end of 2016 and 2012, respectively—but that existing supports for conventional technologies that are embedded in the tax code or through other provisions continue indefinitely. Further, the scenarios do not incorporate any additional costs for mercury and air toxins, carbon emissions, or other environmental externalities associated most strongly with conventional generation technologies. Key variables evaluated by the models include solar resource quality, cost of electricity, transmission requirements, reserve requirements, variability impacts, and projected fuel prices. For the SunShot scenario, solar technology installed system prices are assumed to reach the SunShot Initiative’s targets by 2020: $1/watt (W) for utility-scale PV systems, $1.25/W for commercial rooftop PV, $1.50/W for residential rooftop PV, and $3.60/W for CSP systems with up to 14 hours of thermal energy storage capacity.2 The reference scenario is modeled with moderate solar energy price reductions to enable comparison of the costs, benefits, and challenges relative to the reference case of achieving the SunShot price targets. 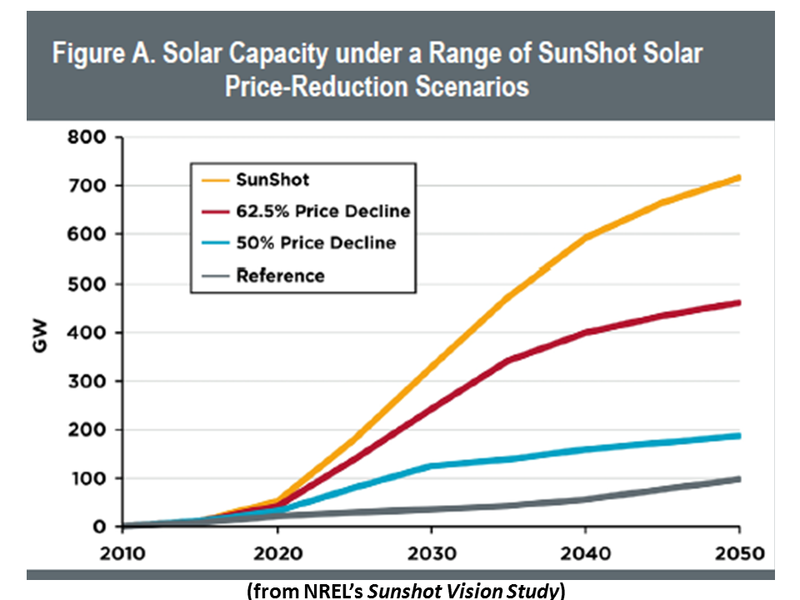 The SunShot Vision Study examines the potential pathways, barriers, and implications of achieving the SunShot Initiative’s price-reduction targets and resulting market-penetration levels. Key factors examined include current and projected costs, raw material and labor availability, manufacturing scale-up, grid integration, financing, and siting and environmental issues. The SunShot Vision Study does not prescribe a set of policy recommendations for solar energy in the United States, nor does it present a vision of what the total mix of energy sources should look like in the future. The SunShot Vision Study does, however, provide analysis and insights that could help policymakers design and implement measures aimed at optimizing solar energy’s potential within an integrated national energy policy framework. The study’s focus on both a 20- and 40-year time horizon allows sufficient time to implement and realize the benefits of policy changes. It also provides a framework for analyzing both the short- and long- term evolution of the U.S. electricity-generation system, and is long enough to envision substantial change to the system as a whole. Thus, this study provides insights about both the near- and long-term technology investments and policy changes that may be required to achieve the envisioned levels of market penetration. Achieving the level of price reductions envisioned in the SunShot Initiative could result in solar meeting 14% of U.S. electricity needs by 2030 and 27% by 2050. However, realizing these price and installation targets will require a combination of evolutionary and revolutionary technological changes. The SunShot Initiative aims to reduce the price of solar energy systems by about 75% between 2010 and 2020. Achieving this target is expected to make the cost of solar energy competitive with the cost of other energy sources, paving the way for rapid, large-scale adoption of solar electricity across the United States. Existing challenges can be addressed through technological advances—e.g., efficiency improvements, materials substitutions, and expanded material supplies—and planning. 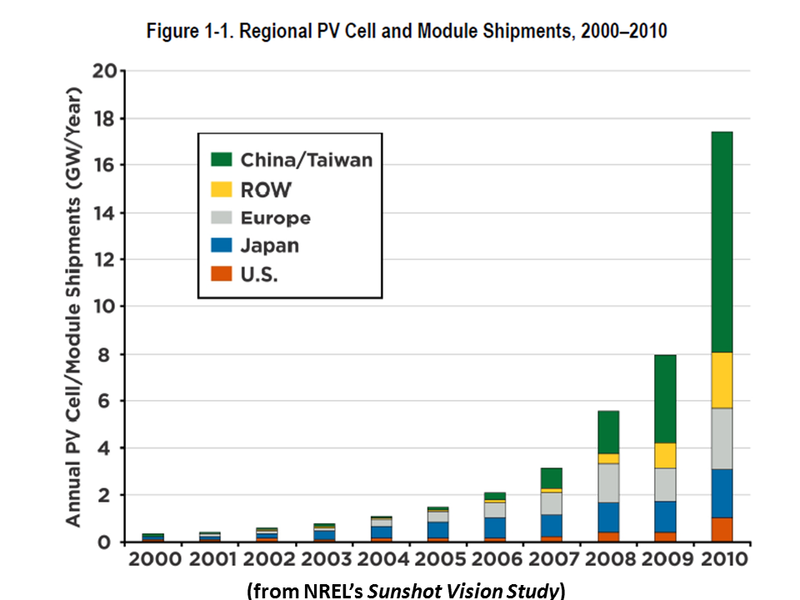 Significant manufacturing scale-up is required under the SunShot scenario, but solar manufacturers have demonstrated the ability to scale up rapidly over the past decade. The continued expansion and price reductions anticipated over the next decade should enable the required high-volume, low-cost production. Achieving the SunShot price targets is projected to result in the cumulative installation of approximately 302 gigawatts (GW) of PV and 28 GW of CSP by 2030, and 632 GW of PV and 83 GW of CSP by 2050. To achieve these cumulative installed capacities, annual installations must reach 25–30 GW of PV and 3–4 GW of CSP in the SunShot scenario between 2030 and 2050. By 2030, this translates into PV generating 505 terawatt-hours (TWh) per year of electricity or 11% of total U.S. electricity demand, and CSP generating 137 TWh per year or 3% of total demand. By 2050, this translates into PV generating 1,036 TWh per year or 19% of total demand, and CSP generating 412 TWh per year or 8% of total demand. Annual U.S. electricity-sector carbon dioxide (CO2) emissions are projected to be significantly lower in the SunShot scenario than in the reference scenario: 8%, or 181 million metric tons (MMT), lower in 2030, and 28%, or 760 MMT, lower in 2050. This would provide carbon emissions reductions that are equivalent to taking 30 and 130 million cars off the road by 2030 and 2050, respectively. The emissions reductions are primarily a result of the displacement of natural gas and coal generation. Before 2030, solar primarily offsets natural gas generation, while post-2030, solar begins to significantly offset coal generation. Both the SunShot and reference scenarios require significant transmission expansion. In the reference scenario, transmission is expanded primarily to meet growing electricity demand by developing new conventional and wind resources. In the SunShot scenario, transmission is expanded at a similar level, but in different locations in order to develop solar resources. In the reference scenario, transmission capacity is projected to increase from about 88,000 gigawatt-miles (GW-mi) in 2010 to 102,000 GW-mi in 2030, and 110,000 GW-mi in 2050—a 15% and 25% increase, respectively. In the SunShot scenario, transmission capacity is expected to increase to 100,000 GW-mi in 2030 and 117,000 GW-mi in 2050, a 13% and 32% increase, respectively. Expanding transmission at these rates would require a level of investment well within the historical range of transmission investments during the past few decades. 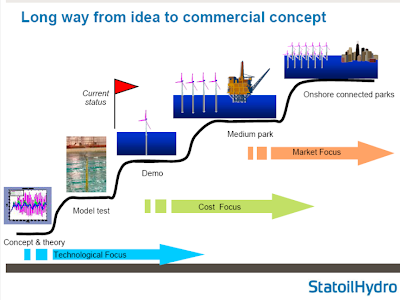 The level of solar deployment envisioned in the SunShot scenario poses significant but not insurmountable technical challenges with respect to grid integration and could require substantial changes to system planning and operation practices. The main grid integration challenges at the bulk system levels are expanding access to transmission capacity and dealing with the additional variability and uncertainty of solar generation. The impact and cost of variability and uncertainty can be reduced by improving access to flexible resources in the system (both generation and load) and optimizing their deployment. Improved solar production forecasts and better access to well-functioning electricity markets are two key enabling factors. At the distribution system level, the main technical challenges are related to control of voltage and system protection with high-penetration PV. In addition to technological advances, existing codes and standards must be revised, and better models and analysis techniques are needed. The land area that is potentially suitable for solar deployment is enormous and thus land, per se, is not a constraint on meeting the SunShot scenario level of deployment. However, it is important to make careful selection of sites in order to provide access to available or planned transmission, and to minimize conflicts with environmental, cultural, and aesthetic interests. otential for CSP is enormous: about 17,500 TWh of annual CSP electricity generation, which is more than four times the 2010 U.S. annual demand, could be sited in seven southwestern states on land that has been pre-screened to avoid prominent land-use issues and to meet technical requirements such as insolation and slope. About 370,000–1,100,000 hectares (ha) (900,000–2,700,000 acres) are required for utility-scale solar installations in 2030 under the SunShot scenario, and about 860,000– 2,500,000 ha (2,100,000–6,300,000 acres) are required in 2050. The required land area is equivalent to about 0.05%–0.14% of the contiguous U.S. land area in 2030 and about 0.11%–0.33% in 2050. 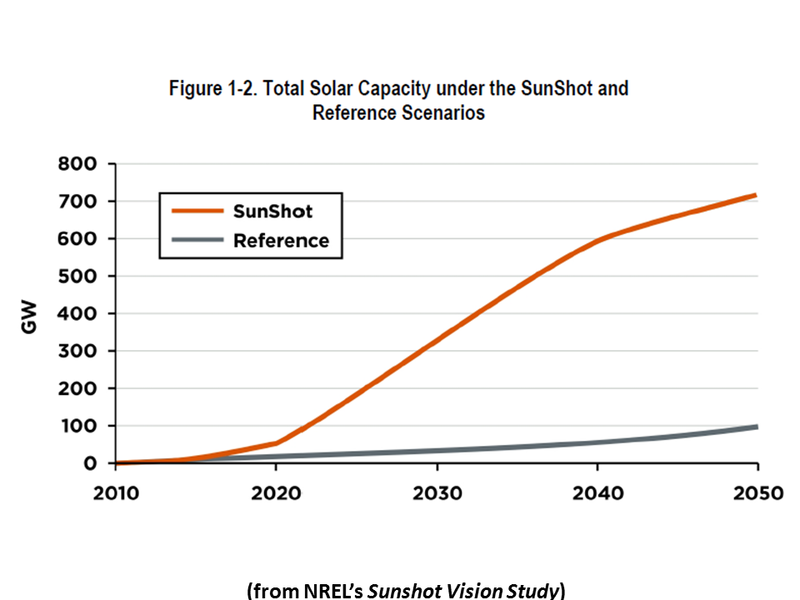 Solar development in the SunShot scenario is greatest in the South and Southwest. Often the highest-quality solar resource areas are dry environments that are typically not well suited for cropland or offer little value for forestry and rangeland. Siting poses significant, but not insurmountable, regulatory challenges to achieving the level of solar market penetration envisioned in the SunShot scenario. The regulatory framework for siting utility-scale solar projects and associated transmission infrastructure is complex, costly, and time consuming. Similarly, distributed PV installers, both in the residential and commercial sectors, face the challenges and expense associated with complex and variable codes and permits, zoning ordinances, and restrictive covenants. Streamlining of siting and regulatory requirements for utility-scale and distributed solar projects, as well as electricity-transmission projects, would help to enable the rapid solar development envisioned under the SunShot scenario. Water-use constraints will require CSP technologies to transition away from wet cooling toward dry and hybrid cooling. Although PV requires very little water (for occasional panel washing), CSP with traditional wet cooling uses similar amounts of water as used by some conventional electricity-generation technologies. However, dry or hybrid CSP cooling technologies can reduce water use by 40%–97% compared with wet cooling. Because most land suitable for CSP is in the Southwest, where water availability is constrained, it is very likely that in order to achieve the level of deployment projected in the SunShot scenario, most CSP plants will need to use dry or hybrid cooling. Financing the scale of expansion in the SunShot scenario will require significant new investments in the solar manufacturing supply chain and in solar energy projects. 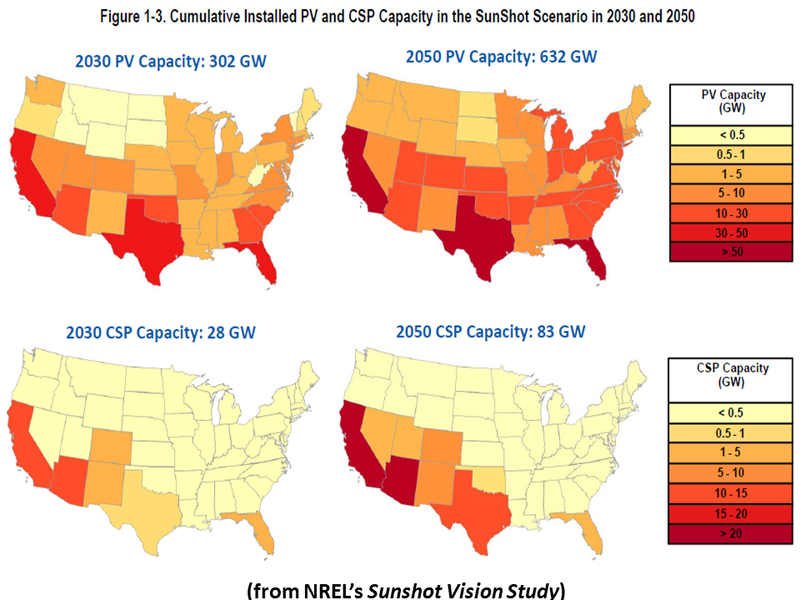 Building out U.S. PV and CSP manufacturing capacity to meet the level of installations envisioned in the SunShot scenario would require cumulative investments of roughly $25 billion through 2030 and $44 billion through 2050. On an annual basis, the required level of investments would be on the order of $1–$3 billion, well below private sector investments in solar in the United States during the past couple of years. Investments in the solar supply chain have historically been financed by a mix of venture capital, private equity, public equity, and corporate debt. Financing solar project deployment under the SunShot scenario, however, will cost much more than financing the supply chain—on the order of $40– $50 billion per year between 2030 and 2050. On a cumulative basis, this translates into roughly $250 billion through 2030 and $375 billion through 2050. The primary financing challenge will be managing the transition from the pre-2020 period, when solar electricity is less cost competitive with other electricity sources, to the post-2020 period, when the availability of cost-competitive solar energy should stimulate private solar investment and facilitate use of mainstream financial instruments. 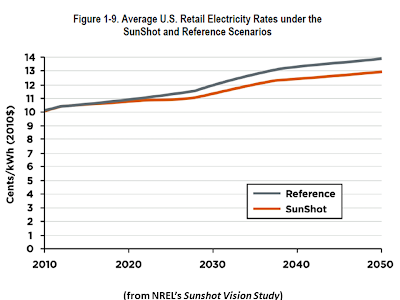 Achieving the SunShot scenario level of solar deployment would result in significant downward pressure on retail electricity prices. 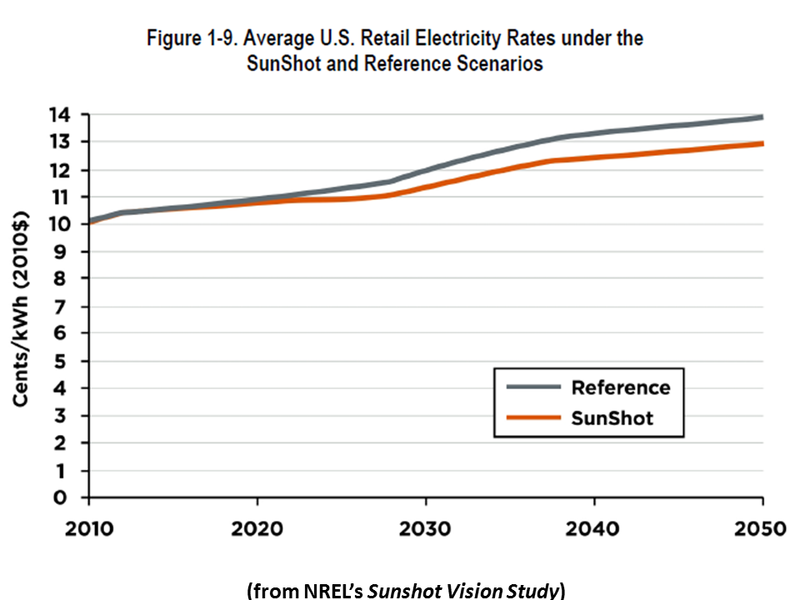 By 2030, the average retail price for electricity in the SunShot scenario is projected to be 0.6 cents/kilowatt-hour (kWh) less than in the reference scenario, which translates into a cost savings of about $6 per month, per household. By 2050, the average retail price of electricity is projected to be 0.9 cents/kWh less, which translates into a cost savings of about $9 per month, per household. 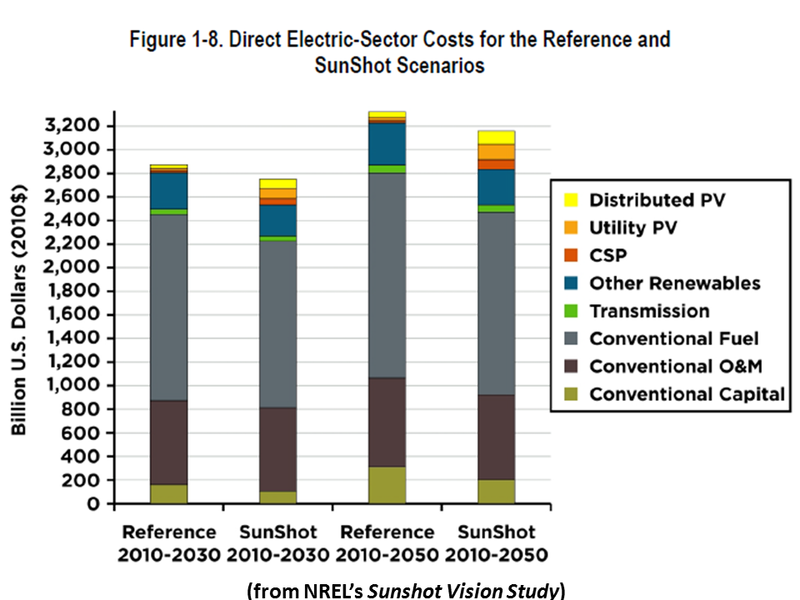 Across all market sectors, the lower electricity prices in the SunShot scenario translate into about $30 billion in annual cost savings by 2030 and $50 billion in annual savings by 2050, compared to the reference scenario. Achieving the SunShot scenario level of solar deployment could support 290,000 new solar jobs by 2030, and 390,000 new solar jobs by 2050. These figures include direct and indirect jobs for the PV and CSP supply chains. 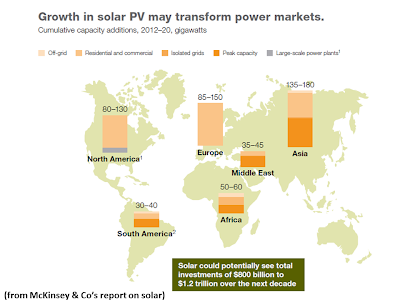 The U.S. PV workforce is expected to grow from about 46,000 in 2010 to 280,000 in 2030 and to 363,000 in 2050. The U.S. CSP workforce is expected to grow from about 4,500 in 2010 to 63,000 in 2030 and to 81,000 in 2050. Labor requirements for manufacturing of PV and CSP components are readily transferable from other industries. Similarly, CSP power plant development can tap into the same skilled engineering and construction labor pool used for conventional fossil-fuel power plant development. The workforce to support distributed PV installations will require additional training and certification within the existing residential and commercial construction industries. 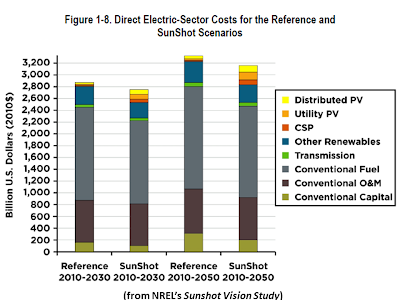 Sensitivity analyses indicate that a number of factors could influence the level of solar deployment envisioned in the SunShot scenario, including more aggressive cost reductions in other renewable and conventional electricity-generation technologies, fossil fuel prices, electricity demand growth, and other assumptions. 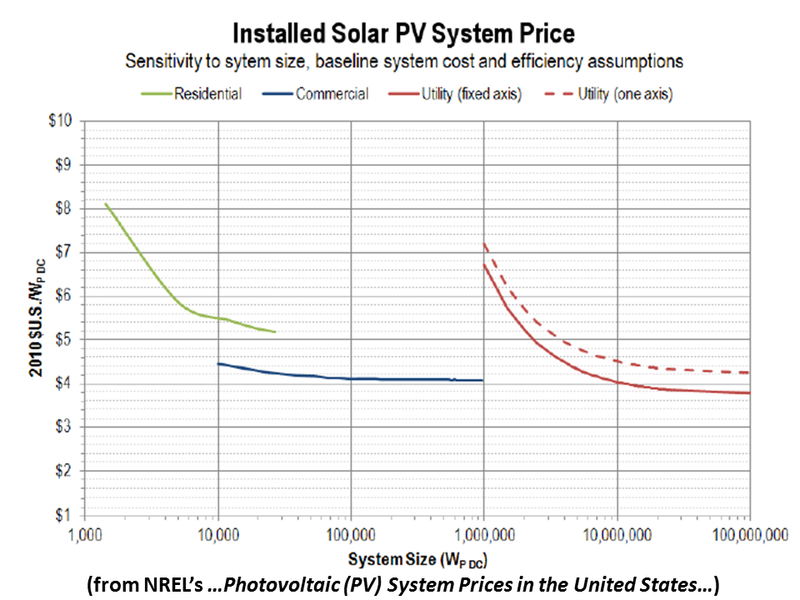 For example, sensitivity analyses indicate that there is a solar price threshold at which solar deployment increases non- linearly as price decreases. Similarly, sensitivity analyses show that assuming larger price reductions for non-solar renewable technologies in the SunShot scenario would result in higher penetration of those technologies, particularly wind. Some sensitivity analyses are presented in Appendix C. Additional sensitivity analyses will be published in supplementary technical reports. 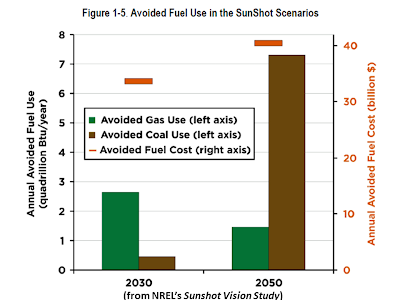 The SunShot Vision Study looks primarily at the implications of and challenges associated with a very low-cost solar future, and generally assumes much less aggressive improvements in other renewable technologies. There are, however, significant opportunities to reduce the cost of other renewable technologies and thus see additional benefits from their market penetration as well.